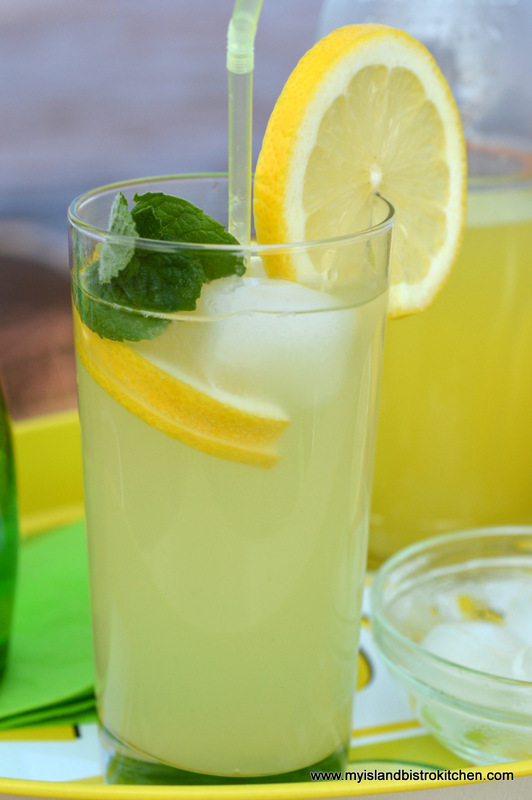 Hot, lazy days of summer always send me off looking for thirst-quenching cold drinks. 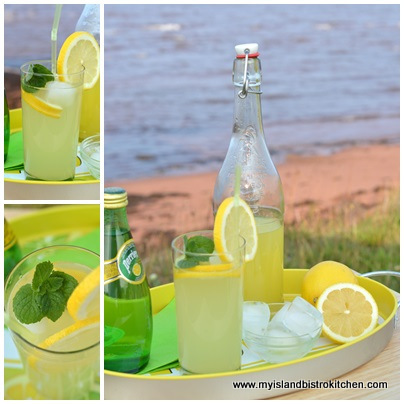 One of my favorites is old-fashioned homemade lemonade. It’s cool and refreshing. 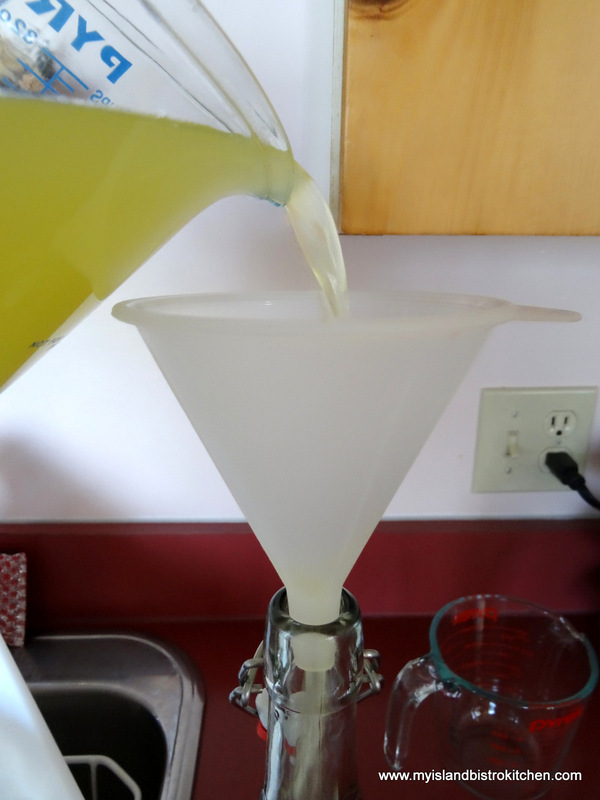 Making the concentrate for the lemonade is really easy and I think it tastes ever-so-much better than bought lemonade. 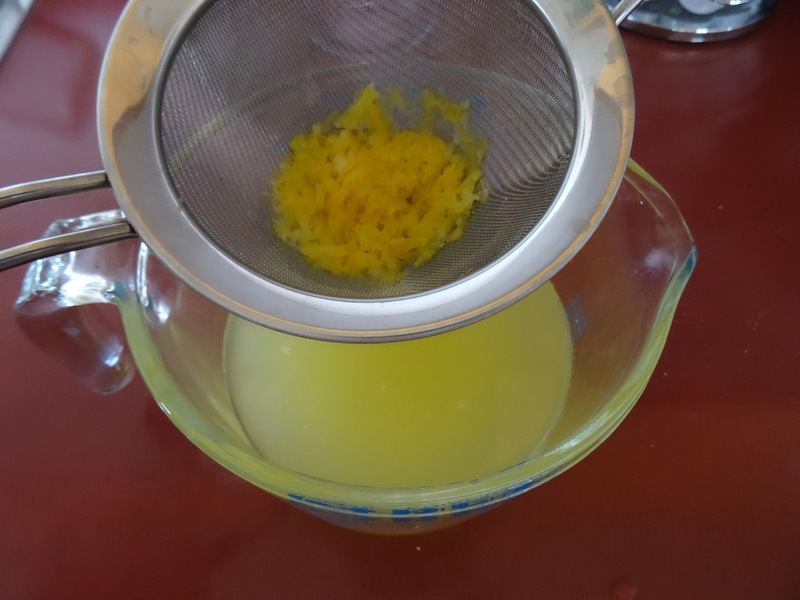 Squeeze lemons and strain juice. 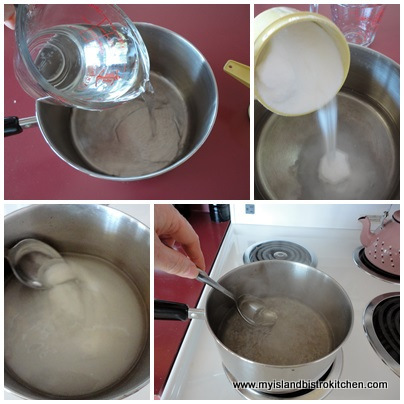 Boil water and sugar for 3-4 minutes. Turn off heat and cool for apx. 30 minutes. 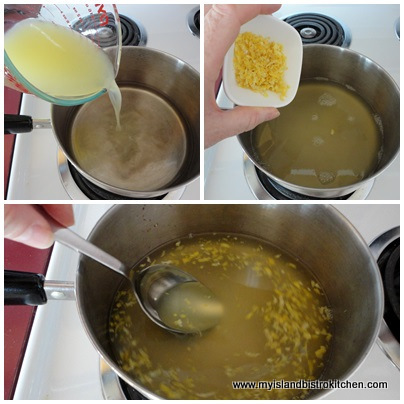 Add lemon juice and grated lemon rind. Stir. Let sit at room temperature for at least 3-4 hours to allow flavour to strengthen. Strain lemon rind from concentrate. 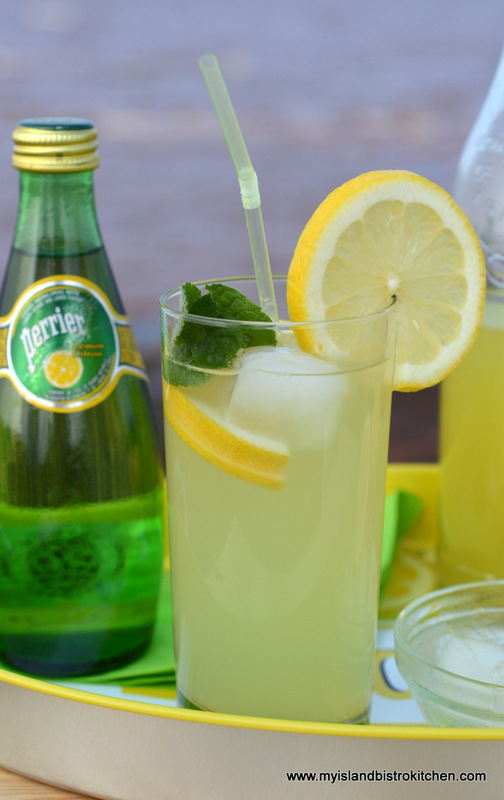 To serve: Pour ½ to ⅔ cup of lemon concentrate into tall glass and top up with lemon-flavored sparkling water. 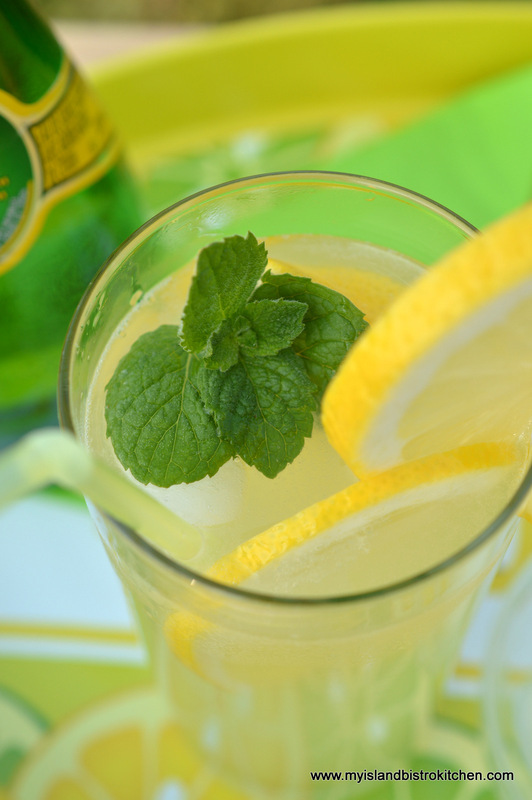 Add ice cubes or crushed ice if desired and decorate with a sprig of mint and a slice or two of lemon. 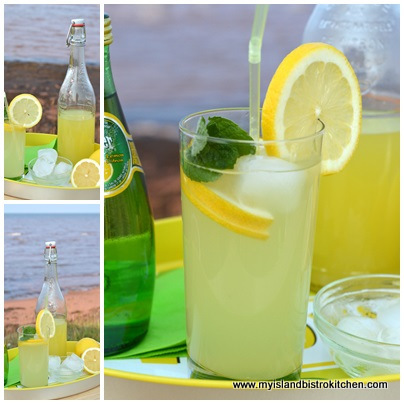 Lemonade is a very versatile drink – it’s great for picnics, sitting on the front porch, at afternoon tea, at the beach, or anywhere for that matter. 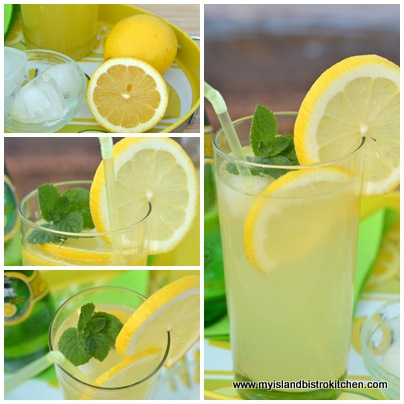 Is lemonade part of your summer? 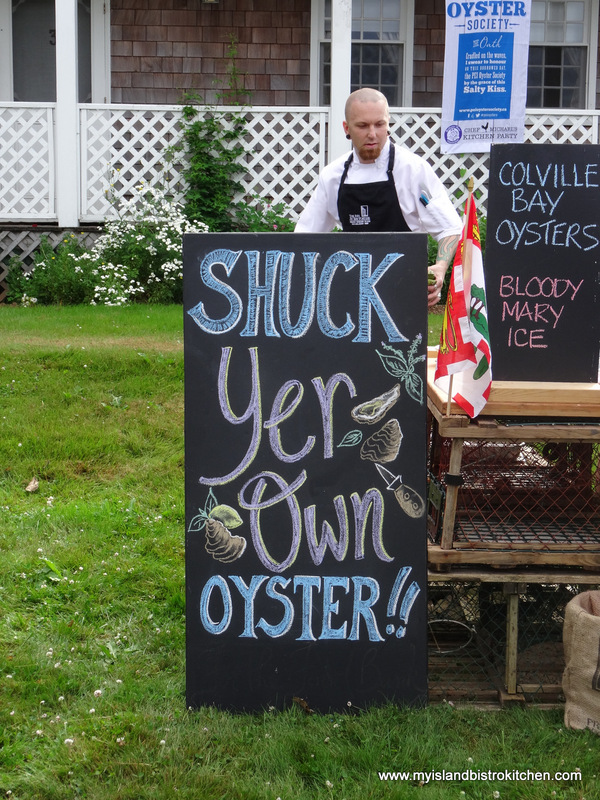 It’s not often that I discover a new food on Prince Edward Island. 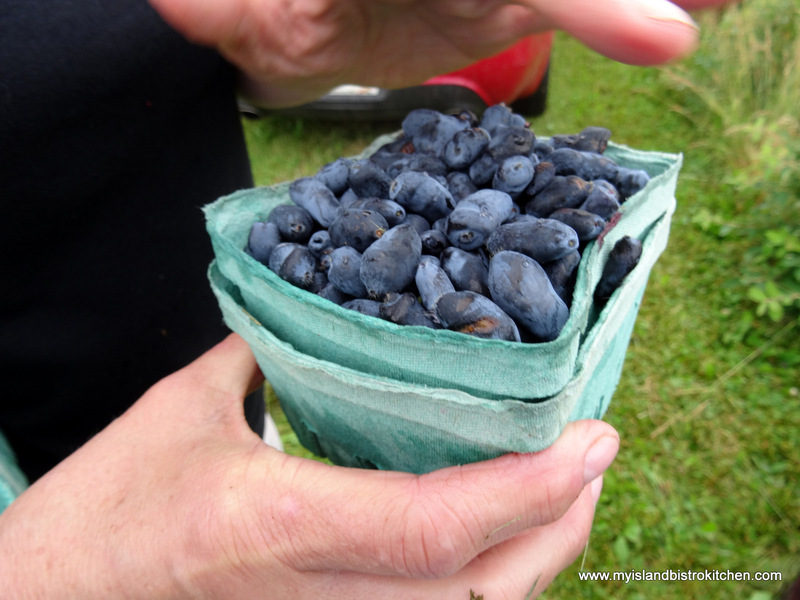 Until recently, I had never heard of haskap berries and did not know that they were grown on PEI. 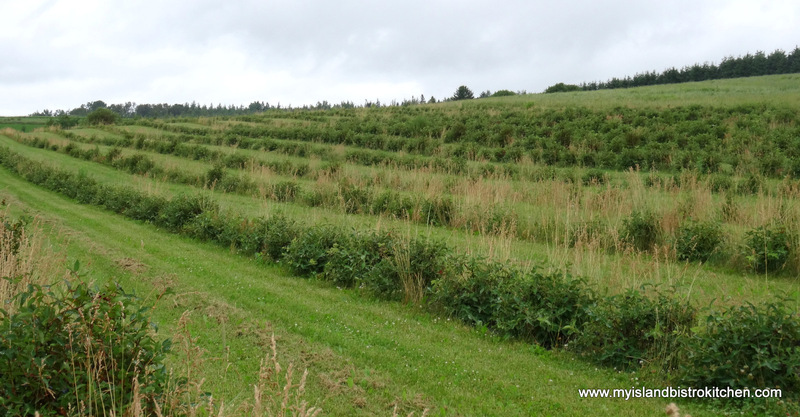 Earlier this month, I travelled to Rollo Bay in the Eastern end of the Island to view a five-acre field of haskap bushes and to have a chat with the growers. Mother and daughter duo, Lynn and Becky Townshend, began growing 2500 haskap bushes five years ago. 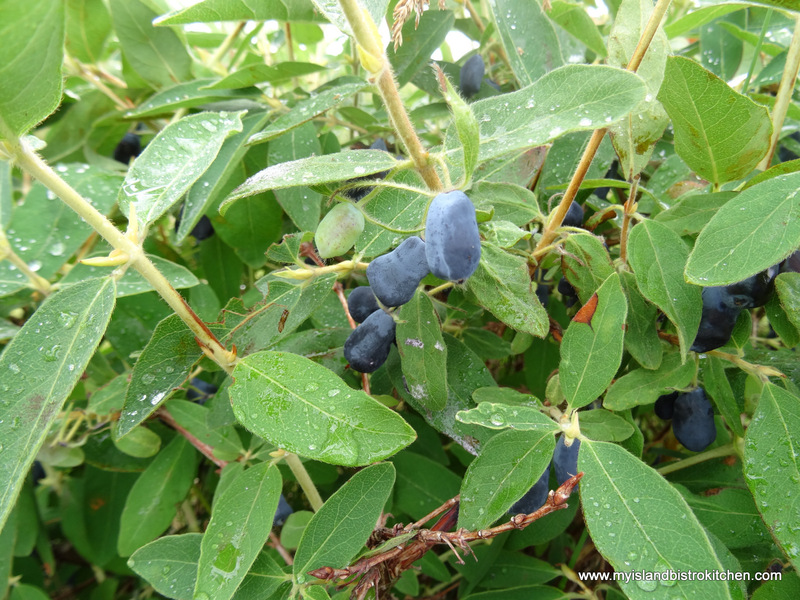 Haskap bushes are very hardy and can withstand cold winter temperatures. They are also fast-growing and, once established, are one of the season’s earliest plants to bear fruit. Before meeting the Townshends, I did a little research on the elongated-shaped berries which are the color of blueberries. 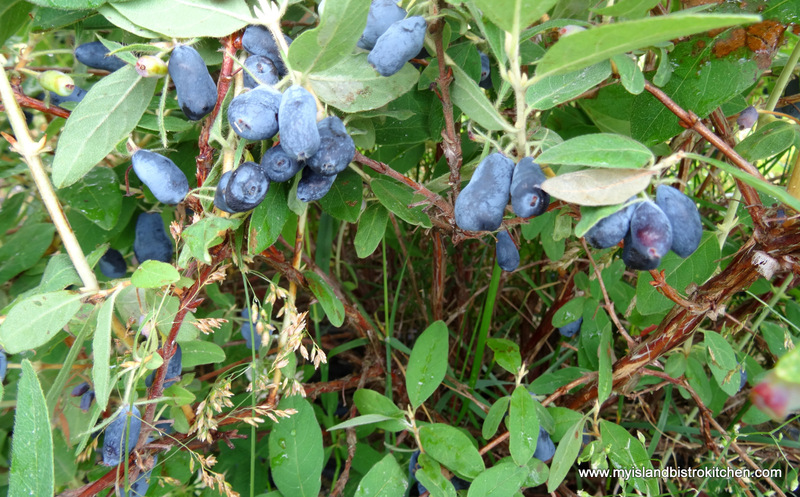 I imagined they would grow on a low bush and, because they somewhat resemble blueberries, thought they would taste something like traditional blueberries. However, that is not the case. Their color is where I find the similarity with blueberries ends. They grow on high bushes like the ones in the photograph below. 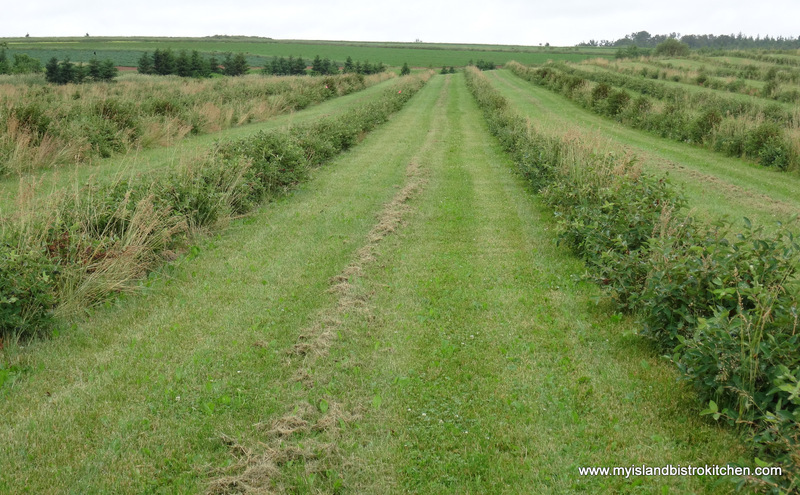 These are five-year old bushes and they range in height probably between about 3-5 feet. Haskaps have their origin in Siberia and are also found in Russia, Japan, and China. A few years ago, Dr. Bob Bors at the University of Saskatchewan developed the haskaps for commercial production. 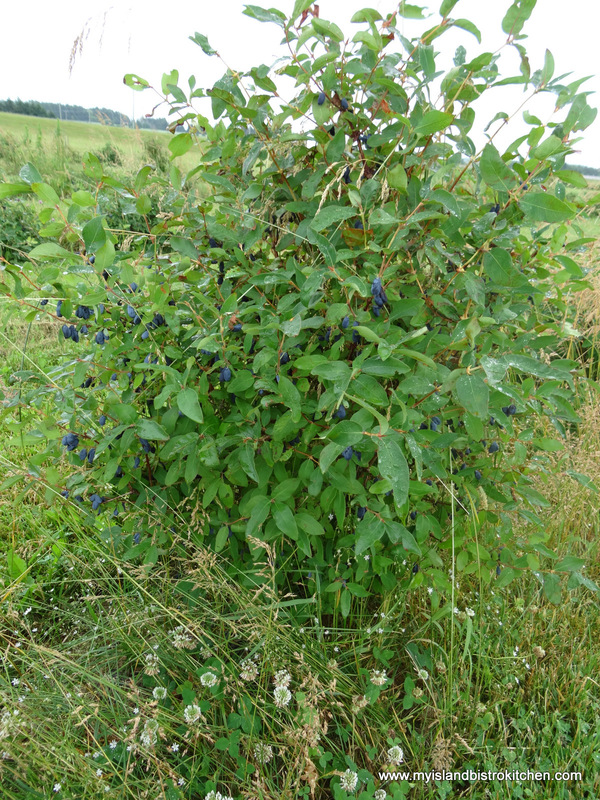 Haskaps are a member of the honeysuckle family and are sometimes referred to as honeyberries. The Townshends grow four varieties of haskaps -Indigo Gem, Indigo Treat, Tundra, and Borealis. Some varieties are sweeter than others but, for the most part, I would class these berries as tart and they would not be ones I would be likely to eat in a bowl with milk and sugar as I would, say, blueberries or strawberries. Raw, according to my tastebuds, I would suggest the haskaps most closely resemble Concord grapes in flavour while cooked or baked, they are (in my opinion) perhaps closest to black currants. 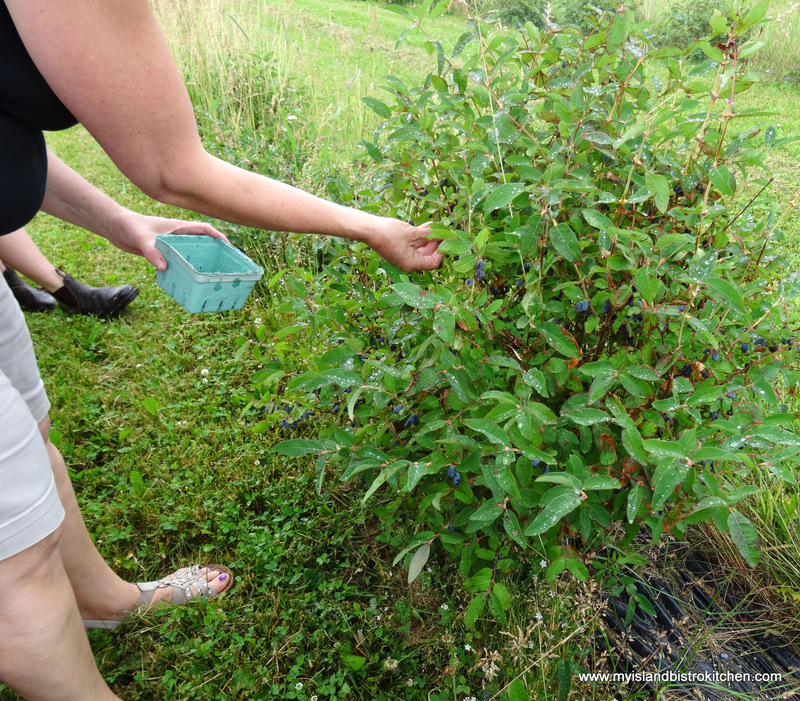 Picking the berries is a tedious and time-consuming task. At present, there is no mechanical harvester available (at least locally) for haskaps which means they must all be picked by hand. As Becky says, “they’re devils to pick”! This is because the berries grow in through the branches and leaves on the bushes and the branches have to be moved away from the plant to reveal the berries. This labour-intensive task is what keeps the price of the berries high. At time of writing, Riverview Country Market in Charlottetown sells pint boxes of haskaps for $6.00 each. So, what can you do with haskaps? They make a great syrup or sauce for pancakes, waffles, French toast, or over ice cream or as the sauce for a shortcake. They can be used in baked goods, alone or in combination with other fruits such as raspberries or blackberries (I find they pair really well with raspberry – the flavors blend together well). They are suitable for pies, muffins, and baked puddings as well as for jam. 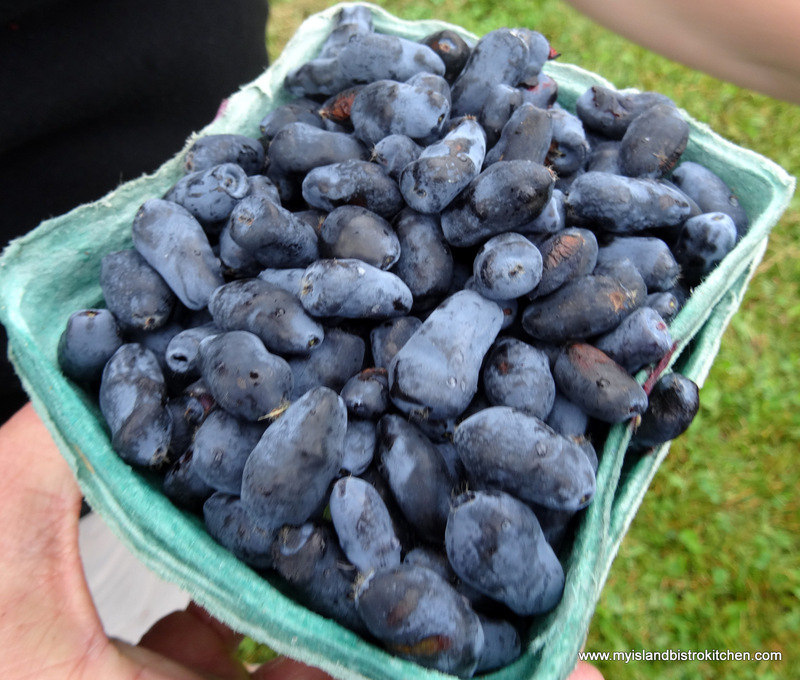 Haskap berries also freeze well for later use. 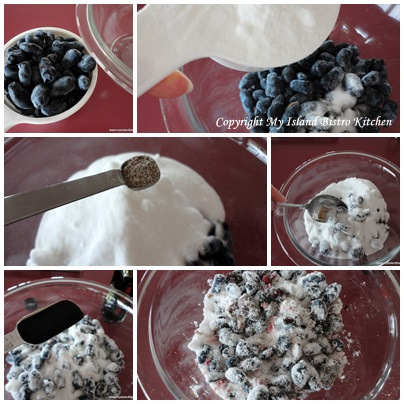 Essentially, you could use haskaps in the same manner in which you would use blueberries, raspberries, or blackberries. The recipe I have chosen to share today using haskaps is for a rich sauce. Adding a mere teaspoon of a high quality raspberry balsamic vinegar and just a dash of cardamom gives additional complexity and flavour to this sauce. This sauce is particularly good in Haskap Shortcake. Place haskaps, sugar, cardamom, and raspberry balsamic vinegar in small bowl. Stir gently to release juice from berries. Do not break up berries. Let sit for 3-4 hours at room temperature (can be placed in covered bowl in refrigerator for up to 24 hours) to allow sugar to begin to naturally dissolve and for the flavors of the berries, balsamic vinegar, and cardamom to blend. Transfer berries to saucepan and add about 1 tsp water or so, just enough so that the berries and sugar do not scorch (do not add too much water as the sauce will be too runny). 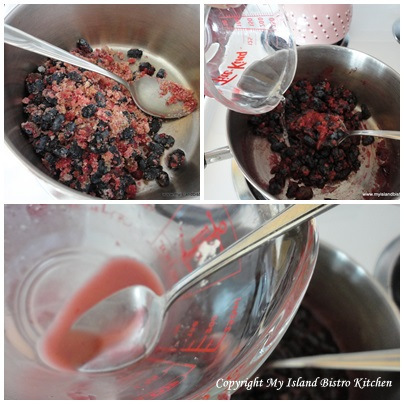 Over medium-low heat, cook berries, stirring gently, just until mixture starts to boil. In small cup, combine 1 teaspoon of cornstarch and 1 teaspoon water to make paste. Temper with about 1 tablespoon of hot berry mixture then stir into berry mixture in saucepan. 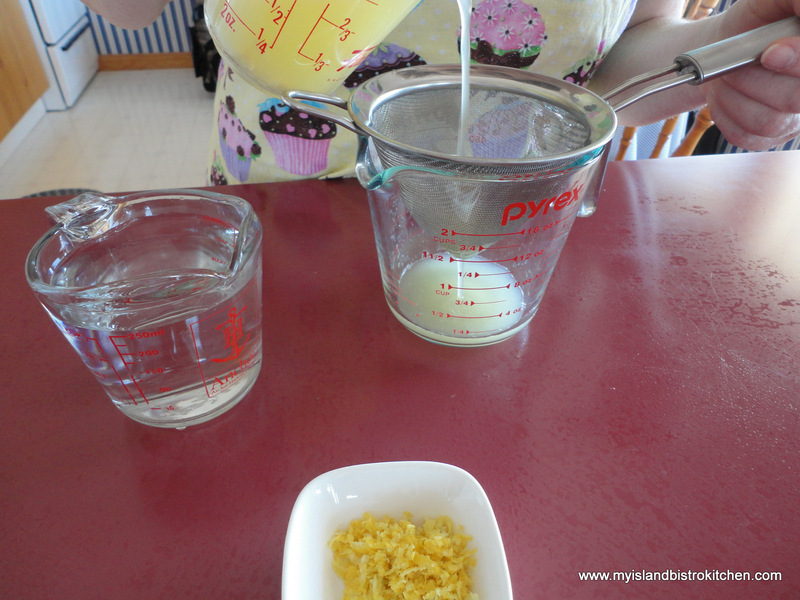 Cook and stir until mixture thickens to desired consistency. Note: It may be necessary to add more cornstarch to reach desired thickness – repeat preceding procedure to mix in any additional cornstarch needed. Remove from heat and let cool. Store sauce in covered bottle in refrigerator for up to one week. Serving Suggestion: Serve sauce over pancakes, French toast, waffles or ice cream. May also be used as a sauce for shortcake. 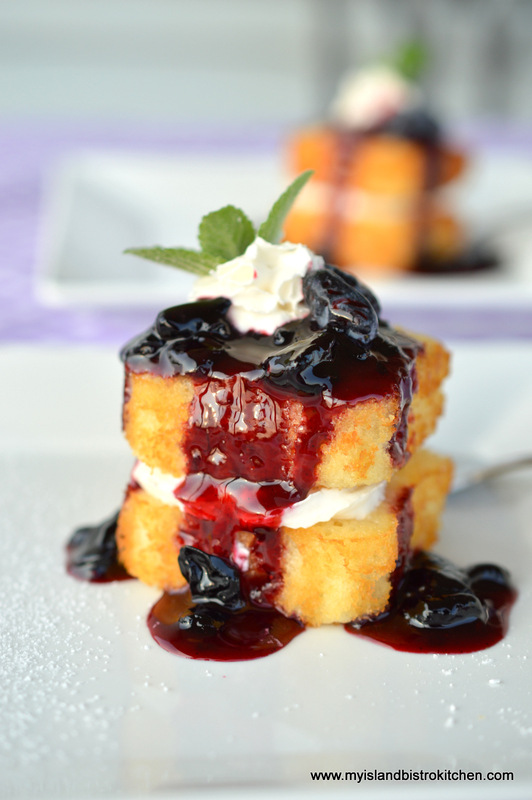 To make Hascap Shortcake, use your favorite sponge cake or biscuits. Split cake or biscuit in half. 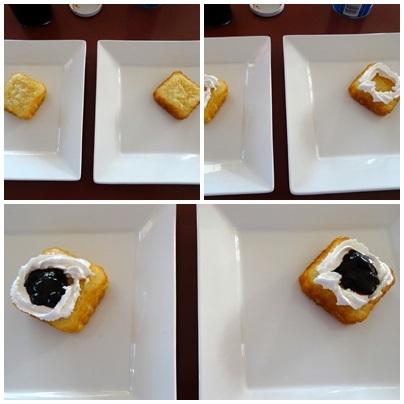 On bottom half, pipe a border of whipped cream around edge of cake or biscuit to form a dam to hold the sauce. In center of whipped cream border, add about 1 tablespoon of hascap sauce. Place top of cake or biscuit over whipped cream and sauce. Drizzle more hascap sauce over top and add a dollop of whipped cream. And, here is the finished product…. 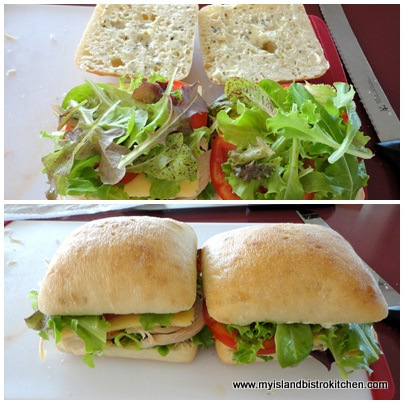 Join My Island Bistro Kitchen on Facebook. Follow the Bistro’s tweets on twitter @PEIBistro. 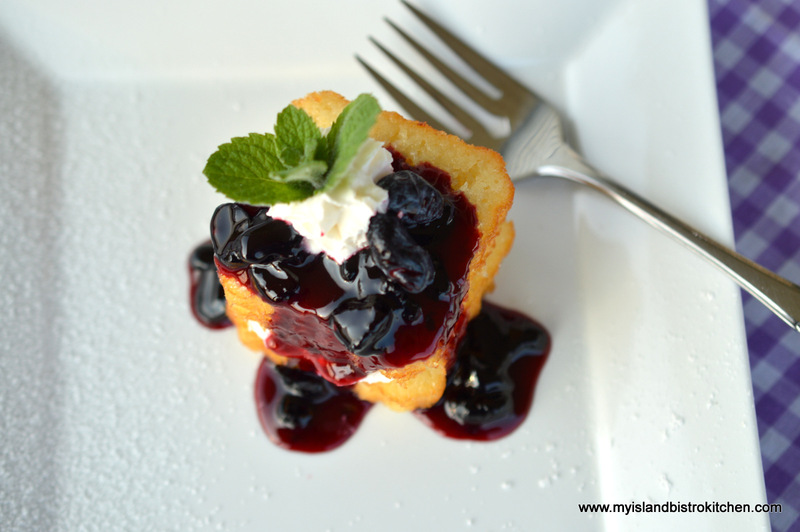 Find the Bistro on Pinterest at “Island Bistro Kitchen”. Follow along on Instagram at “peibistro”. 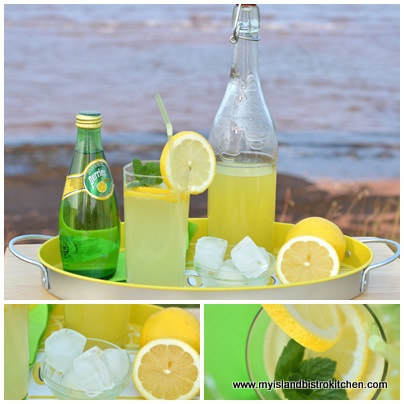 Are you like me, favoring more casual dining in the summer – particularly on weekends? I’m a great fan of picnics. They lend themselves well to casual menus. 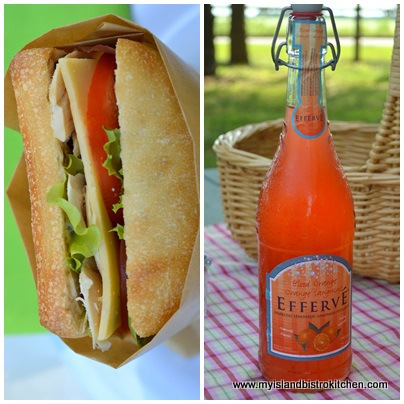 Today, on the picnic menu, I have focaccia rolls filled with slices of rotisserie chicken, Havarti cheese, tomato, and lettuce (recipe follows at end of post). I added some sour cream and onion kettle chips, a blood orange lemonade, homemade chocolate chip cookies and oatcakes, and some fresh fruit and the menu was complete. 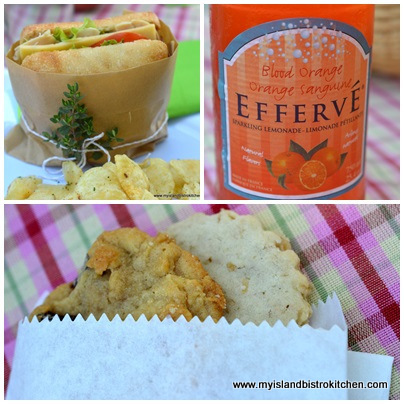 This menu follows my standard template for a picnic: A main (the sandwich); snacks (kettle chips); a drink (the sparkling blood orange lemonade); dessert (cookies); and fruit (peaches, pears, and watermelon). Whether I am dining inside or out, I still like to set a pretty table. 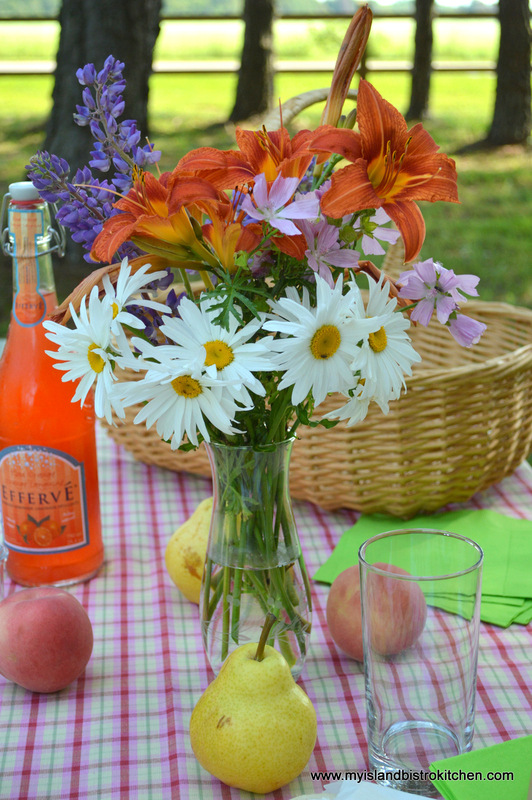 My color theme for today’s picnic is primarily orange with lime green as the secondary color. I often use the fresh fruit as part of the centerpiece as I have done here. 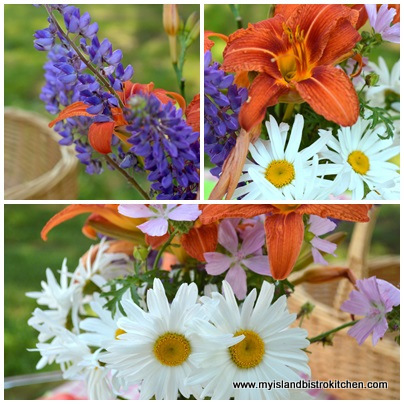 I picked the bouquet of wildflowers along the PEI roadside on my way to my picnic destination – daisies, orange day lilies, mauve matrimony, and the last of the season’s purple lupins – pulling the colors from the plaid tablecloth. 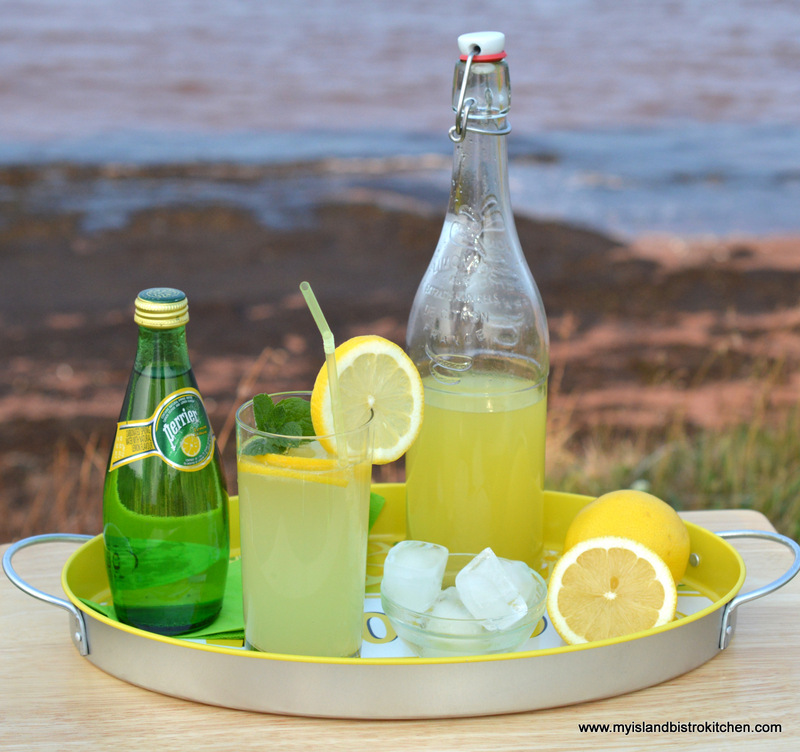 Because I was just a short way from my picnic site, I didn’t need a cooler so I simply gathered everything together and put it in a large wicker basket. However, if you are traveling a distance or if it is going to be awhile before you eat, be sure to use a well-insulated cooler with ice packs to keep the perishable food and drinks cold. 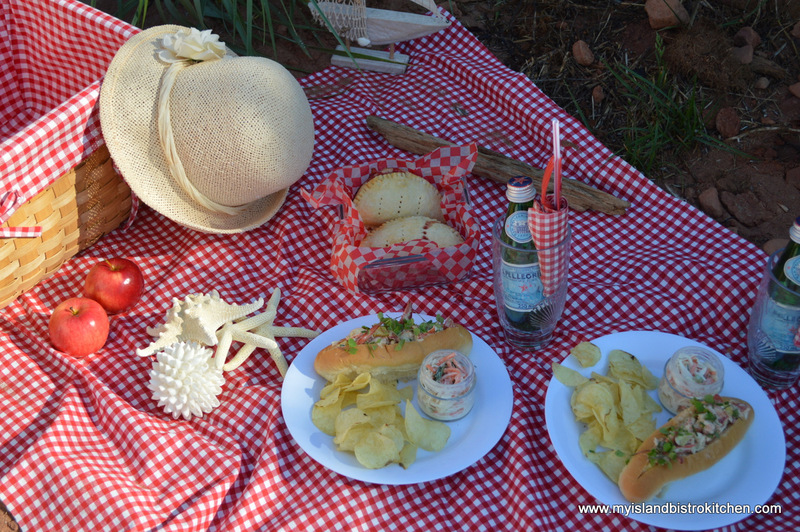 I like to do as much prep work at home as possible so the food is ready to eat when I get to my picnic site. This also means I have less tools and equipment to take with me to do food prep work onsite. Today’s picnic was comprised of all finger food so no utensils were required. 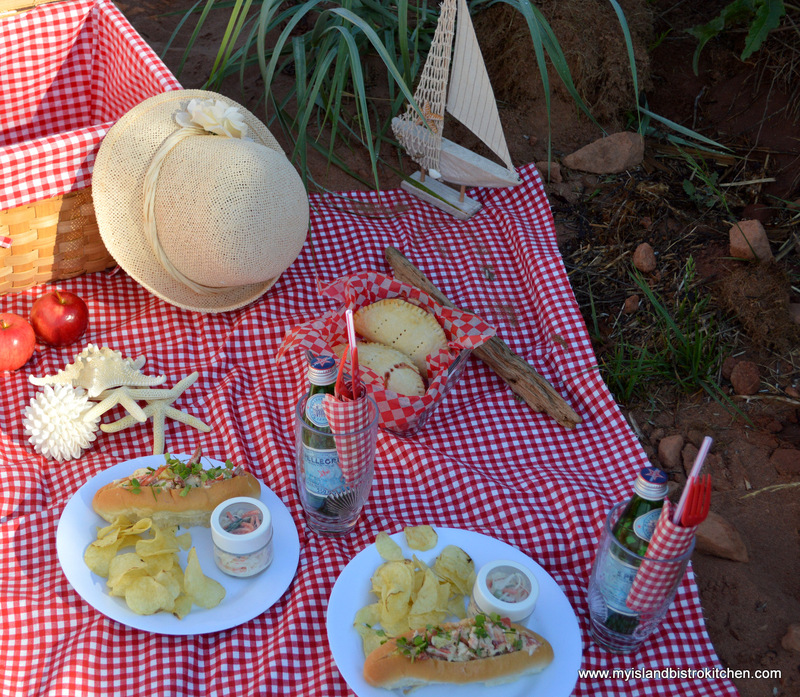 I used my white plastic picnic plates and kept the setting simple and casual. 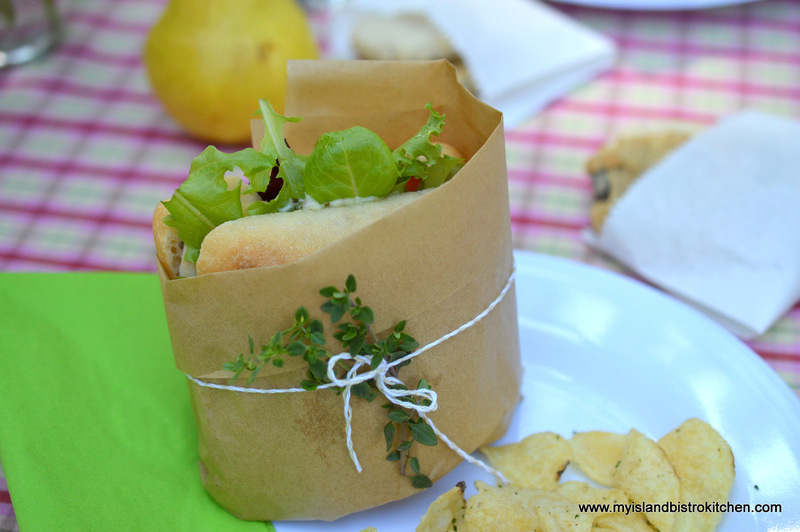 I wrapped each sandwich in brown parchment paper and tied it with string and a sprig of fresh thyme from our herb garden. 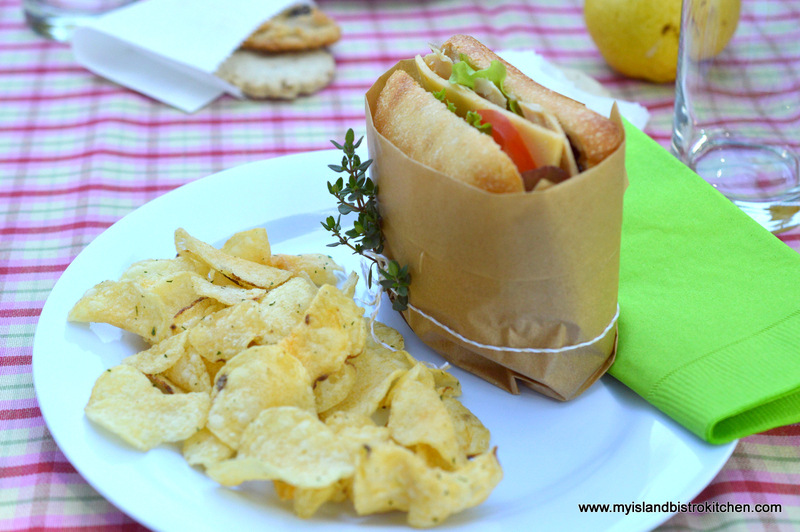 The brown parchment gives the country look and also functions as a convenient holder for the sandwich to keep the ingredients in place while eating. 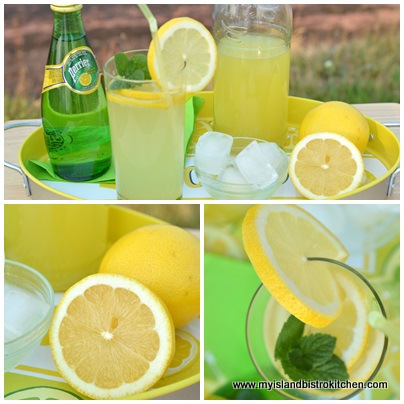 The blood orange lemonade adds a nice rich color to the table as well as being a tasty beverage. When choosing a color scheme, I recommend thinking of the colors in the food being served so that the whole setting is pleasing to the eye – like the green lettuce and napkins, the orange drink and tomato in the sandwiches and the colors of the tablecloth. Dessert for a picnic does not need to be elaborate. 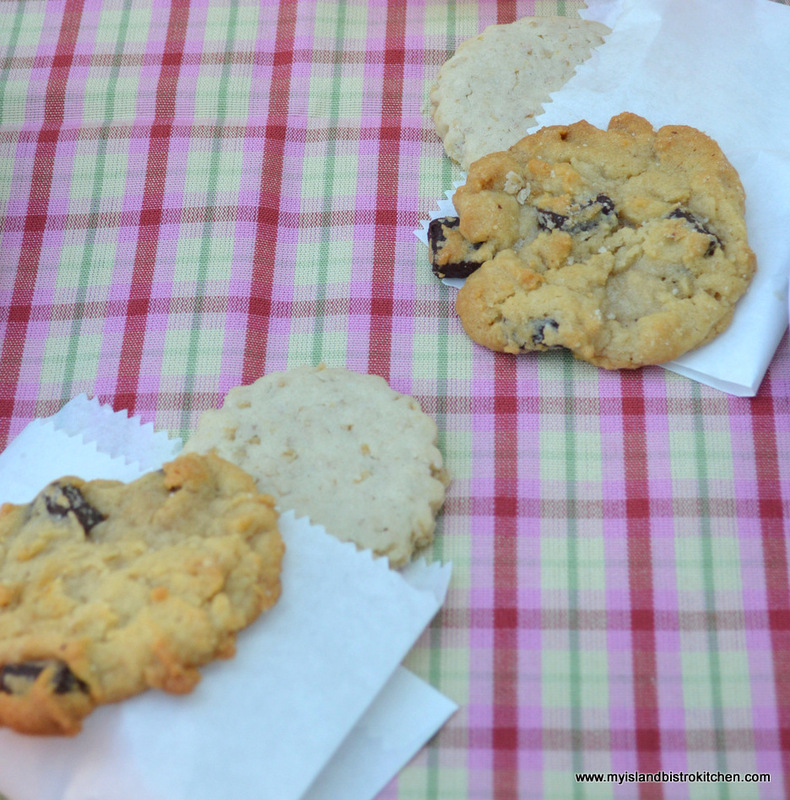 Cookies are a traditional item on many picnics and are very easy to pack. Here I have packaged them in glassine bags. 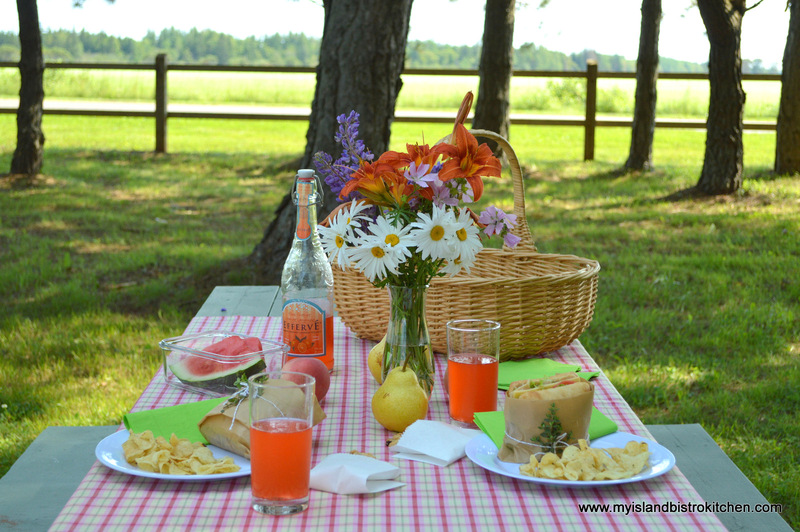 Watermelon is always a hit at picnics (and it matched my color scheme, as a bonus)! 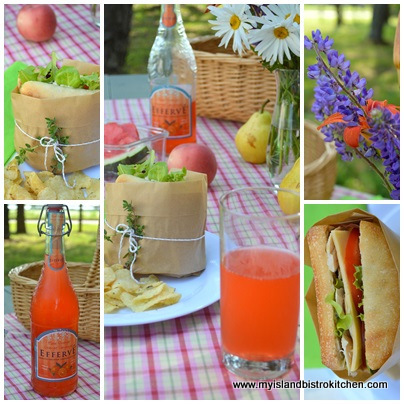 This was a very easy picnic to pull together on a warm summer’s day. 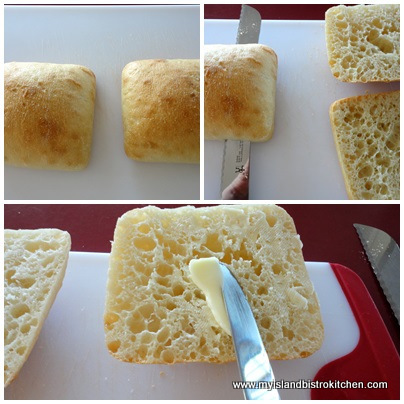 Slice Focaccia rolls in half, horizontally. Butter both sides of each roll. 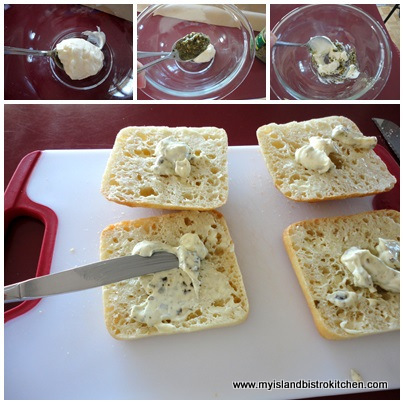 In bowl, mix mayonnaise with pesto. Spread on both sides of each roll. Lay a bed of lettuce on bottom half of each roll. Add a layer of sliced chicken. Season with salt and pepper. 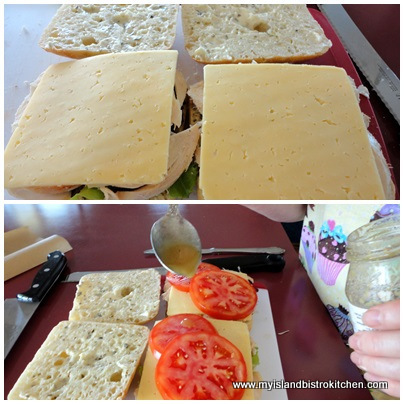 Add one slice Havarti to each roll, then 1-2 slices of tomato. Drizzle a small amount (⅛ – ¼ tsp) balsamic vinaigrette over tomato slices. 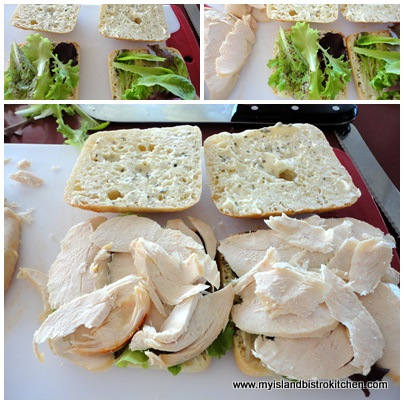 Top with another layer of lettuce and place tops of each roll on the sandwiches. 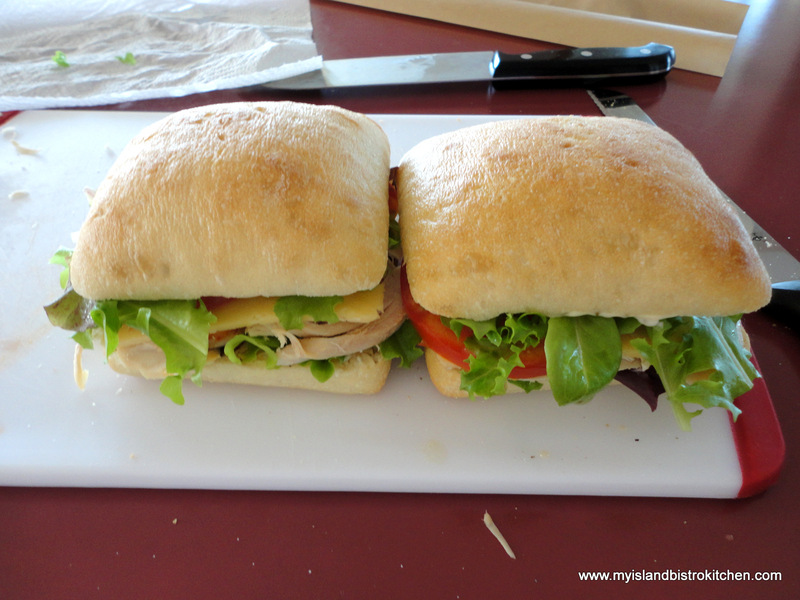 Leave sandwiches whole or slice diagonally, as desired. We all know that over-fishing, not using environmentally-responsible fishing methods, and not taking good care of our waterways will one day lead to a depletion of seafood. 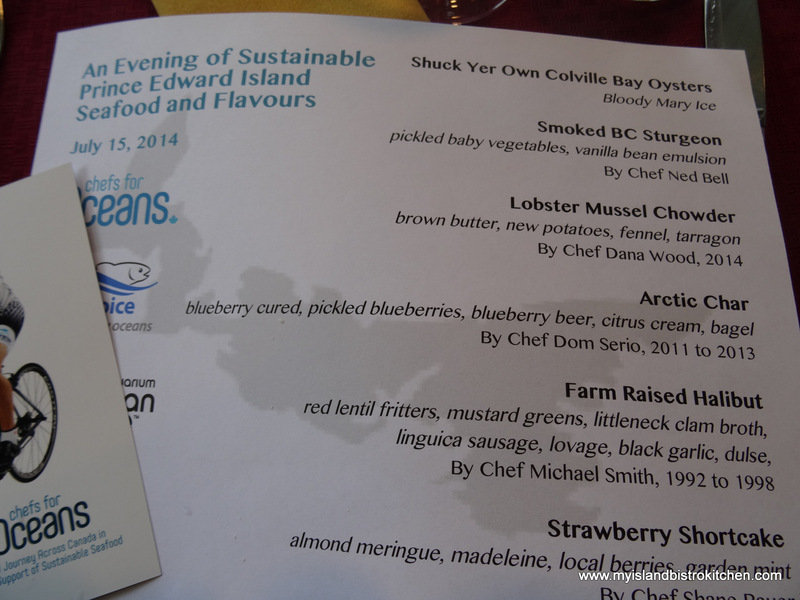 In partnership with Vancouver Aquarium’s Ocean Wise program and SeaChoice, along with a number of other companies, the Chefs for Oceans campaign has been established to support sustainable seafood so we will have seafood for generations to come. A celebrity chef from Vancouver, BC, is on a 10-week cycling adventure across Canada this summer to promote this campaign by raising awareness of the importance and necessity of healthy oceans, lakes, and rivers and by garnering support for sustainable seafood from coast to coast. 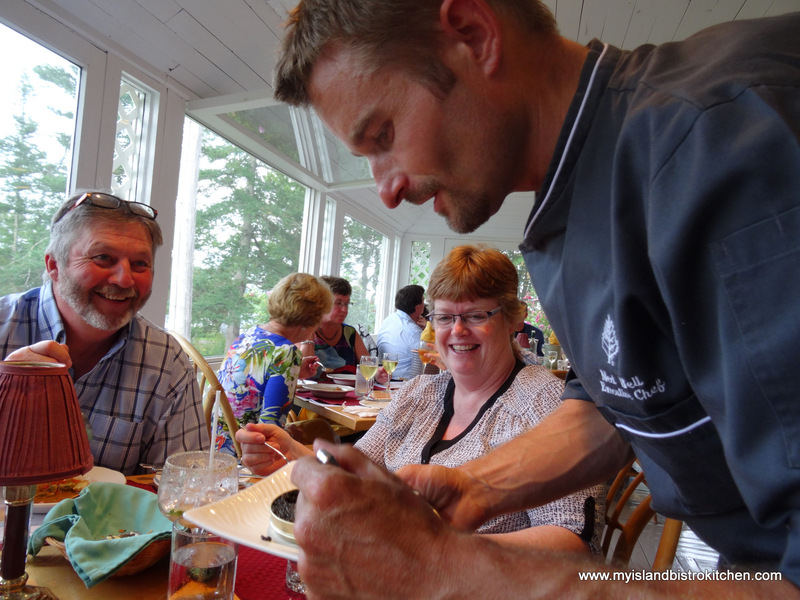 Chef Ned Bell, Executive Chef at Four Seasons Hotel Vancouver, began his cycling journey in St. John’s, NL, on July 1st and he will complete his tour in Vancouver, on September 11th. 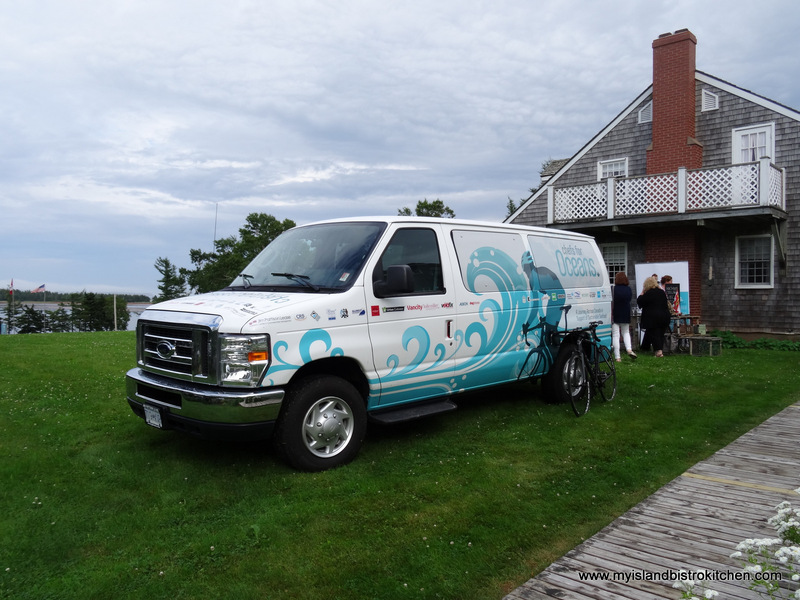 To promote the sustainable seafood movement, he stops and cooks enroute, holding signature events, like the one I attended at the Inn at Bay Fortune, PEI, on July 15th. 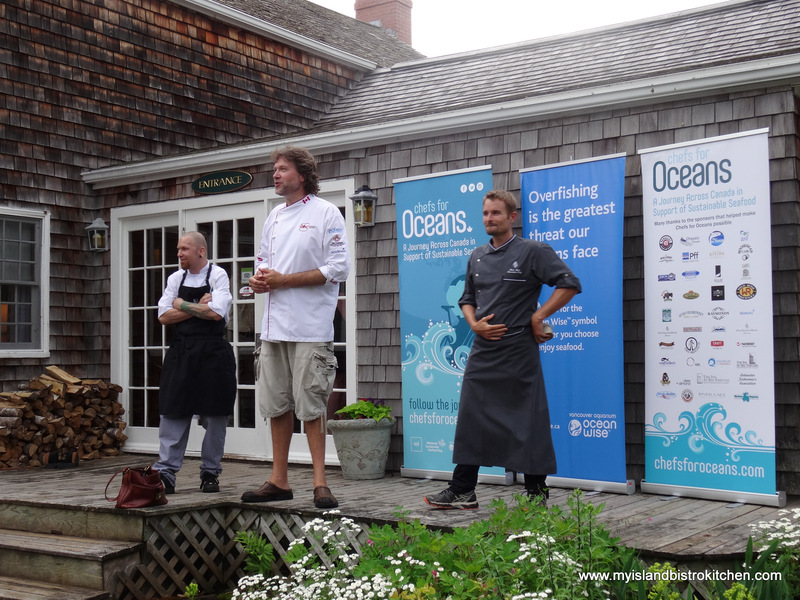 Partnering with five local chefs, including well-known celebrity chef, Michael Smith, a beautiful five-course dinner was prepared featuring seafood. The evening began with a wine bar featuring wine from the Okanagan region. 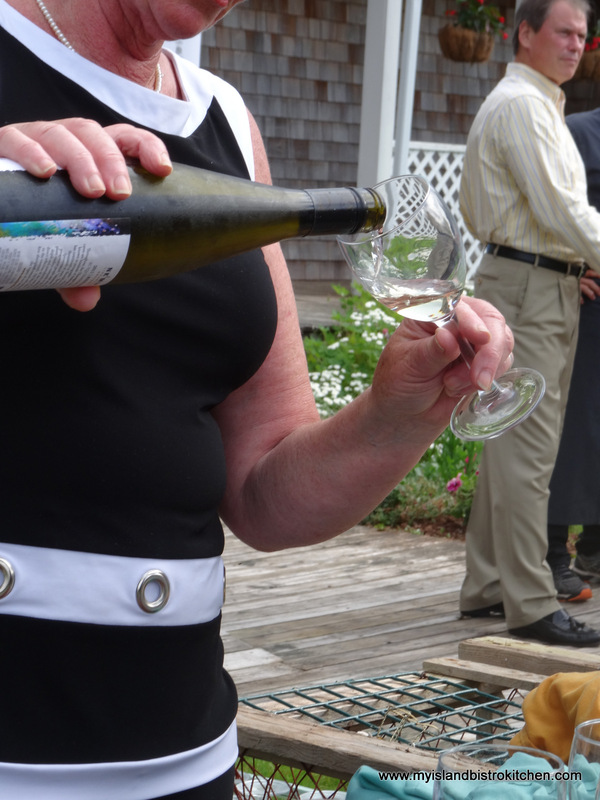 This was paired with PEI Colville Bay Oysters from nearby Souris West. 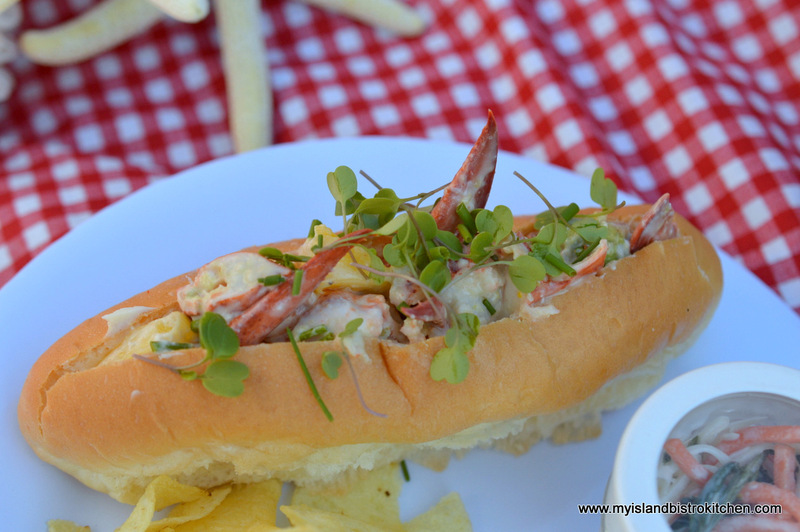 Served with Bloody Mary Ice, these were an immediate hit! 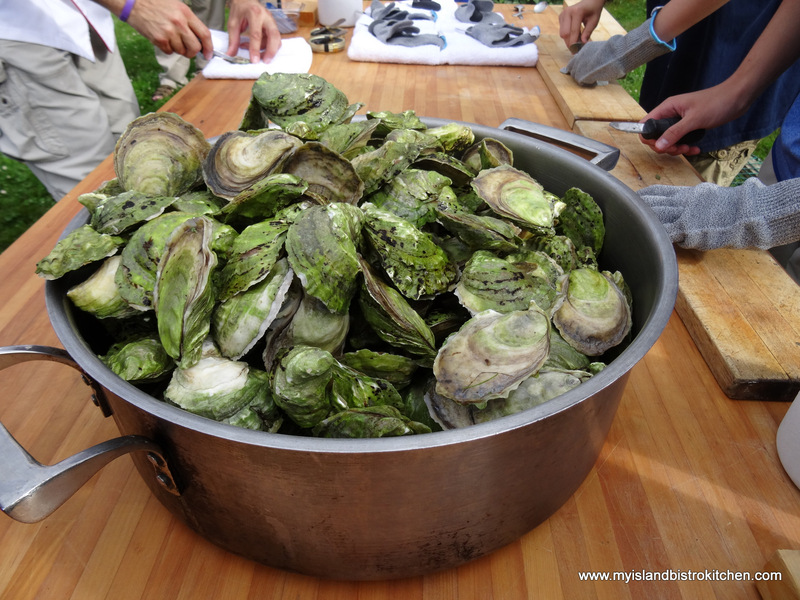 Chef Michael was kept busy shucking oysters. 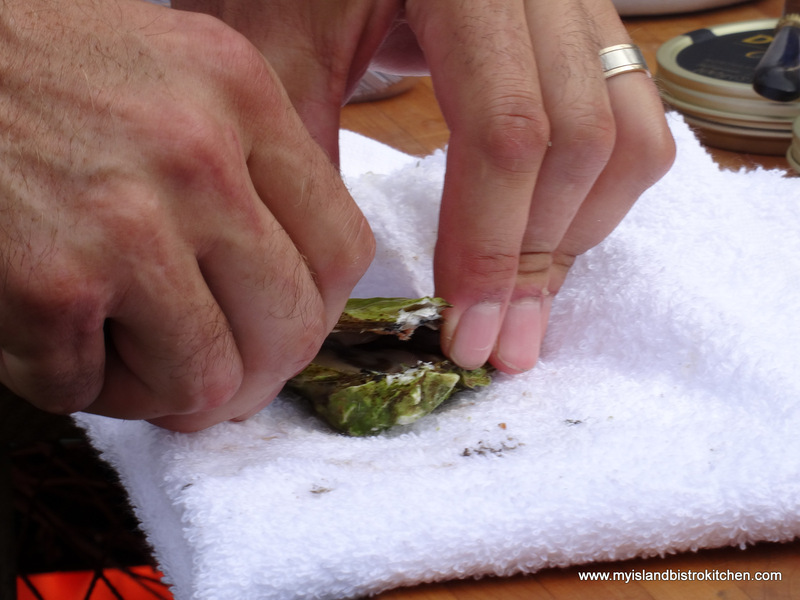 But the option was there for anyone who wanted to try their hand at shucking their own oyster. 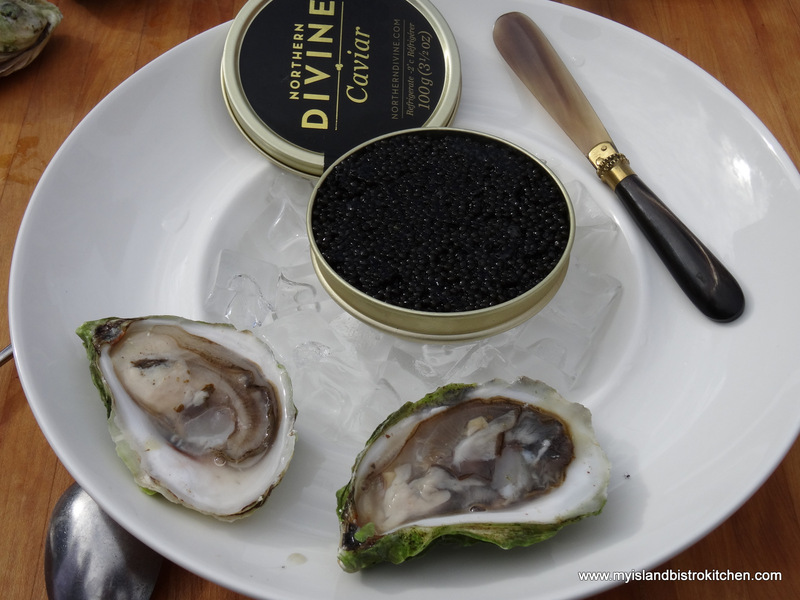 Perhaps a touch of Northern Divine Cavair might go well with a Colville Bay Oyster! 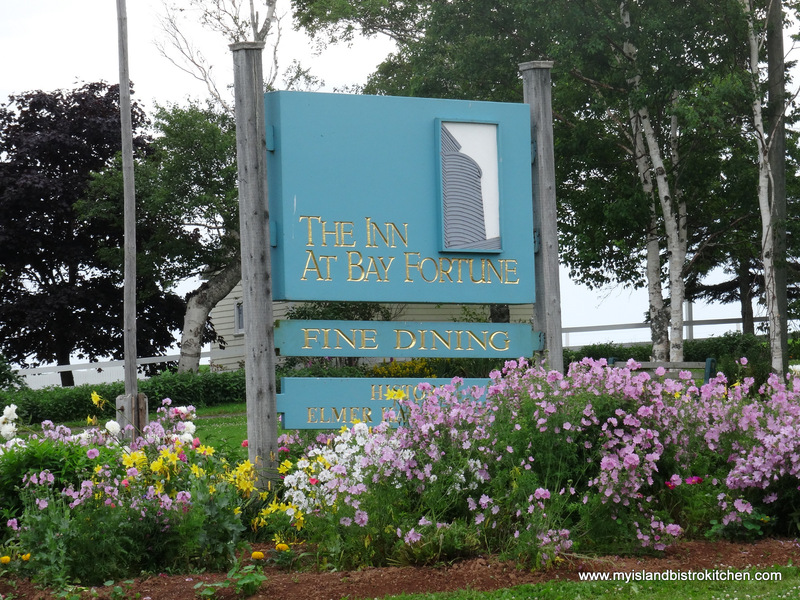 After a few brief remarks from the celebrity chefs, dinner was served in a charming country inn that overlooks Bay Fortune in the beautiful countryside of Eastern Kings County, PEI. 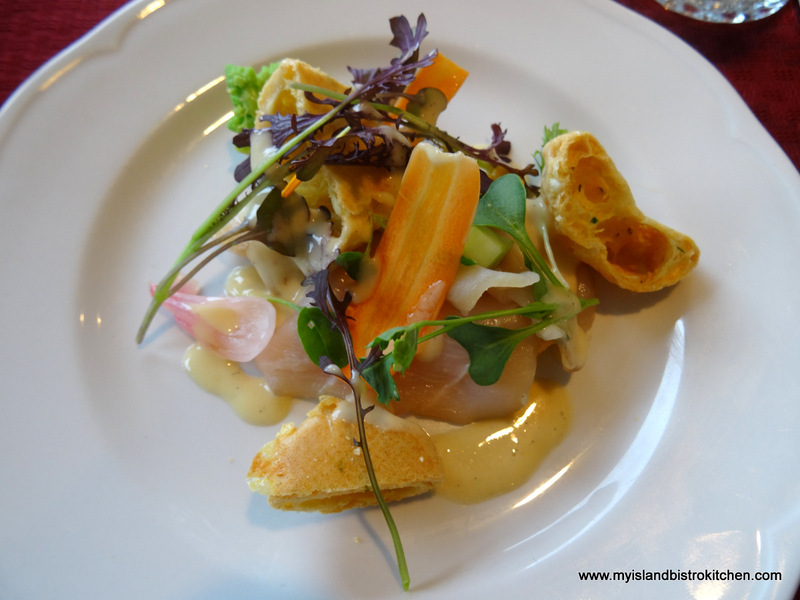 The first course was prepared by Chef Ned and featured smoked BC Sturgeon with pickled baby vegetables and a vanilla bean emulsion. 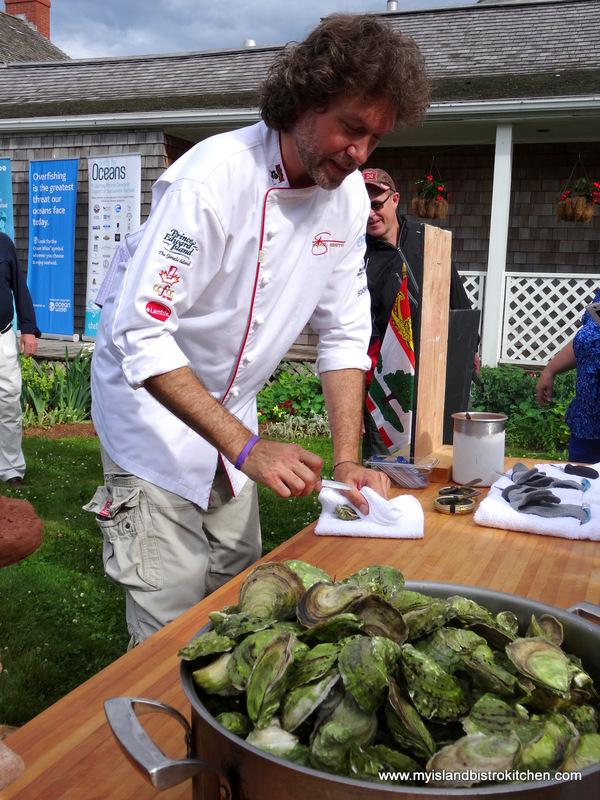 This was followed by a delectable Lobster Mussel Chowder prepared by the Inn’s current chef, Dana Wood. 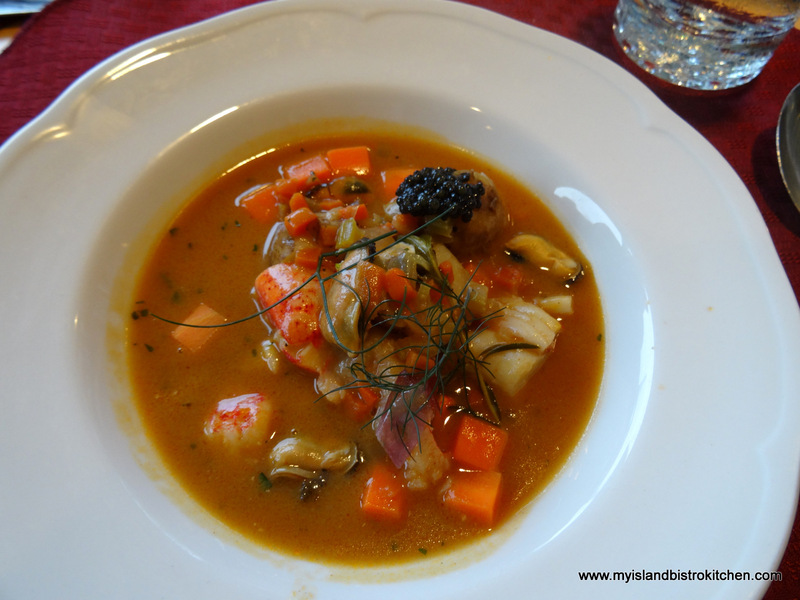 A dollop of caviar served table side by Chef Ned set this chowder off! 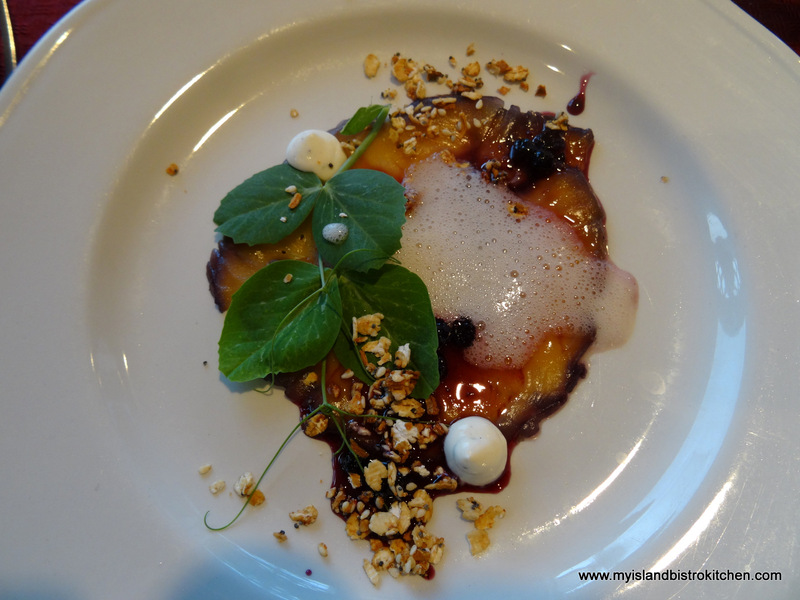 The third course, prepared by Chef Dom Serio, was Arctic Char enhanced by cured pickled blueberries, blueberry beer, citrus cream, and bagel. 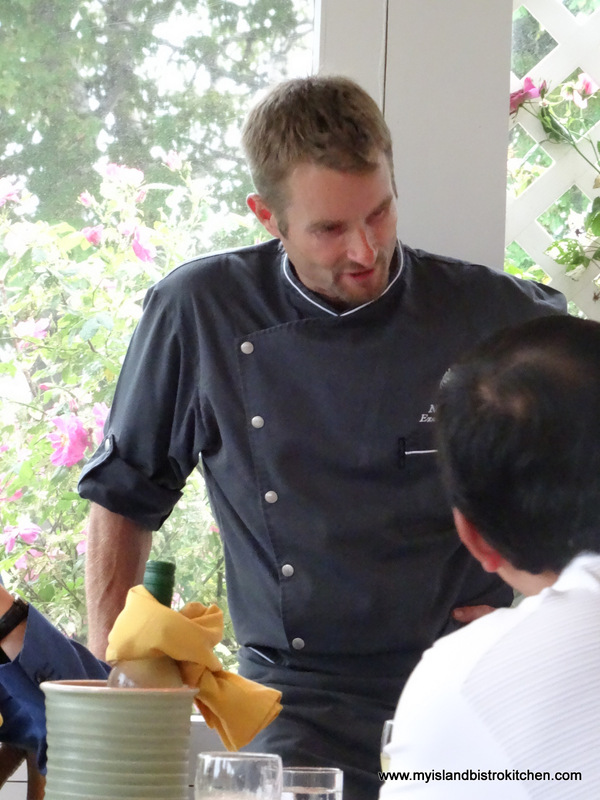 Chef Michael Smith prepared the fourth course of Farm-raised Halibut. 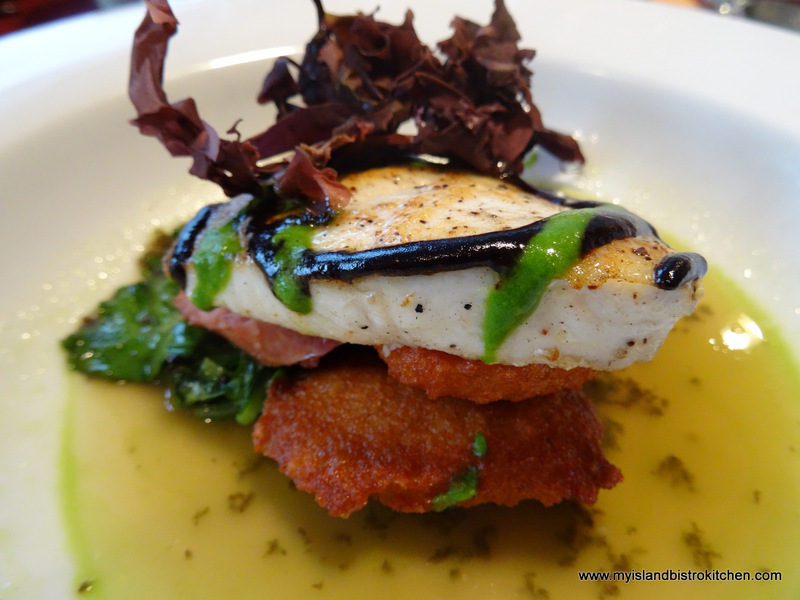 He paired the Halibut with red lentil fritters, mustard greens, littleneck clam broth, linguica sausage, lovage, black garlic and dulse. 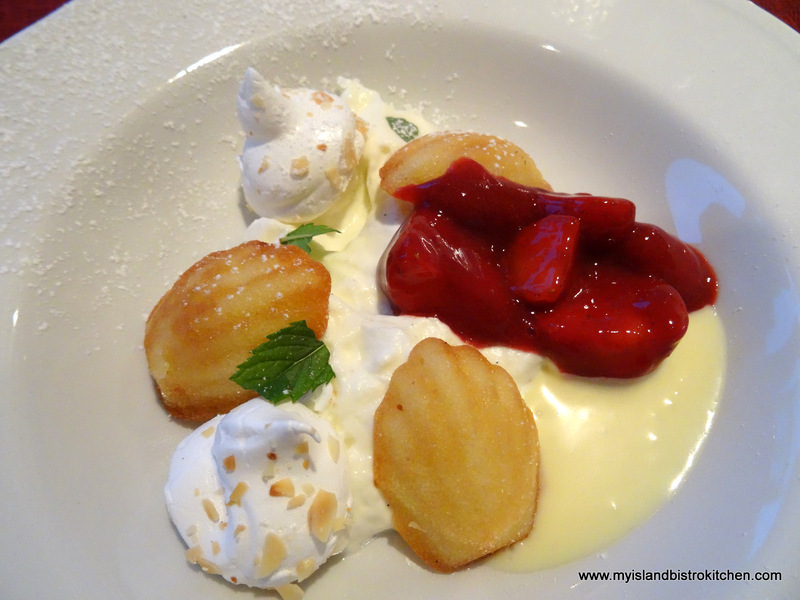 And, for the grande finalé, Chef Shane Bauer prepared Strawberry Shortcake with almond meringues, madeleines, fresh PEI strawberries, and garden mint. 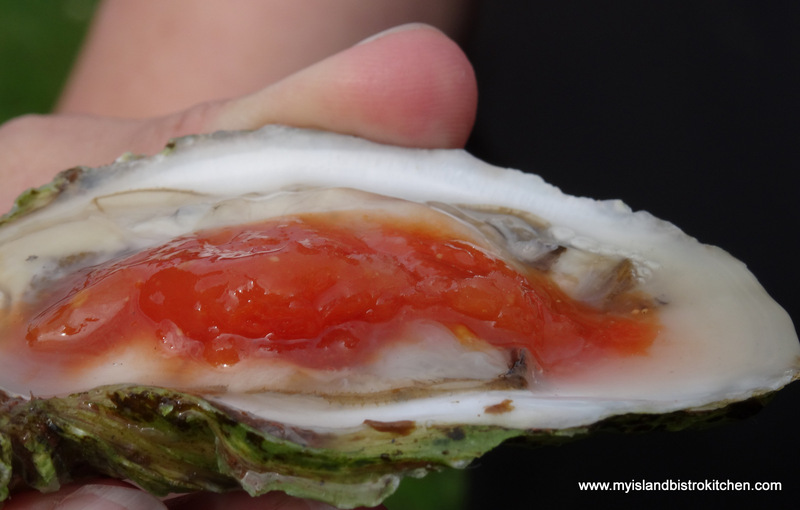 This was a menu guaranteed to make any seafood lover’s mouth water! and this guy on a bike, you know Chef Ned Bell is on his cross-Canada cycling mission to support sustainable seafood. 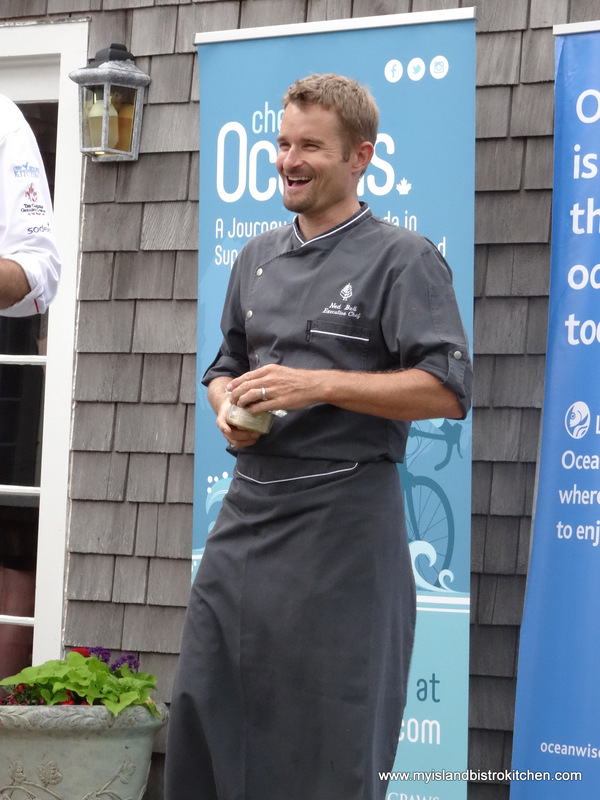 For a complete list of the stops Chef Ned Bell is making and the events he is holding on his cross-country cycling tour, visit the Chefs for Oceans website. There is nothing more plain yet more tasty, in my opinion, than a good old-fashioned brownie. One of the best things about brownies is that they don’t take any ingredients that most bakers are unlikely to have in their cupboards. That means they can be whipped up fairly quickly without a lot of advance planning and a trip to the supermarket. They can also be eaten plain or dolled up with a dob of icing and a piece of maraschino cherry or they can be iced all over. Brownies have stood the test of time and remain a perennial favorite. 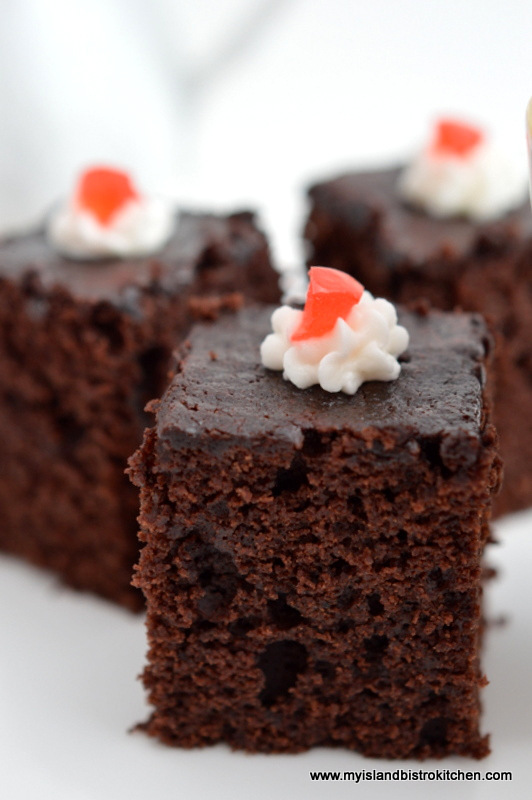 Even today, you are likely to still find brownies gracing sweet trays on refreshment tables at events….and they are rarely the last pieces left standing on the plates. 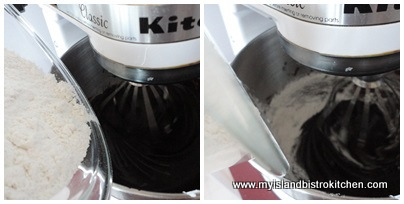 Use a good quality Dutch-processed cocoa powder. It really does make a difference in the taste and it gives the brownie a nice, rich, dark chocolate color. Don’t over-beat or over-mix the ingredients. Just mix them enough so they are incorporated. Don’t over-bake the brownies as it will make them dry. 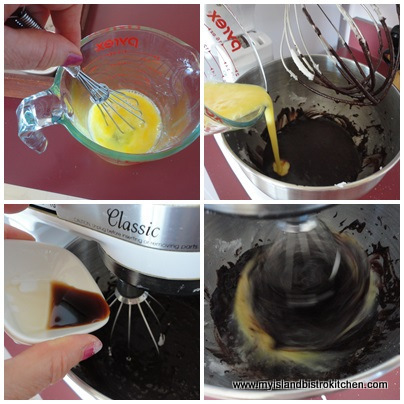 Bake them just until a cake tester comes out clean and they show signs of pulling away from the sides of the pan. I like to line my baking pans with either parchment paper or tin foil and leave enough of a hang-over on the sides that I can easily lift the entire square out of the pan. This makes it very easy to cut squares. These are not the gooey, fudge-like brownies. They are more of a cake-type brownie. They hold up well when you pick them up and they have exceptionally good flavor contingent, of course, on using a good quality chocolate. 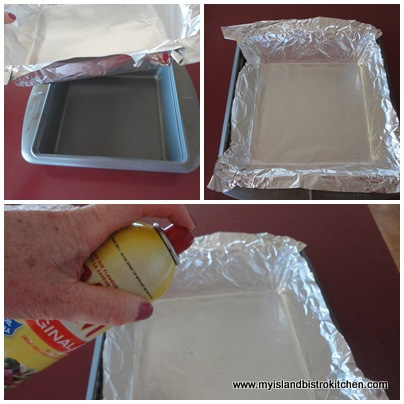 To prepare 8”x8” square pan, line with tin foil and spray with cooking oil. Set aside. Cream shortening and white sugar together. Mix cocoa and boiling water together until smooth and lump-free. 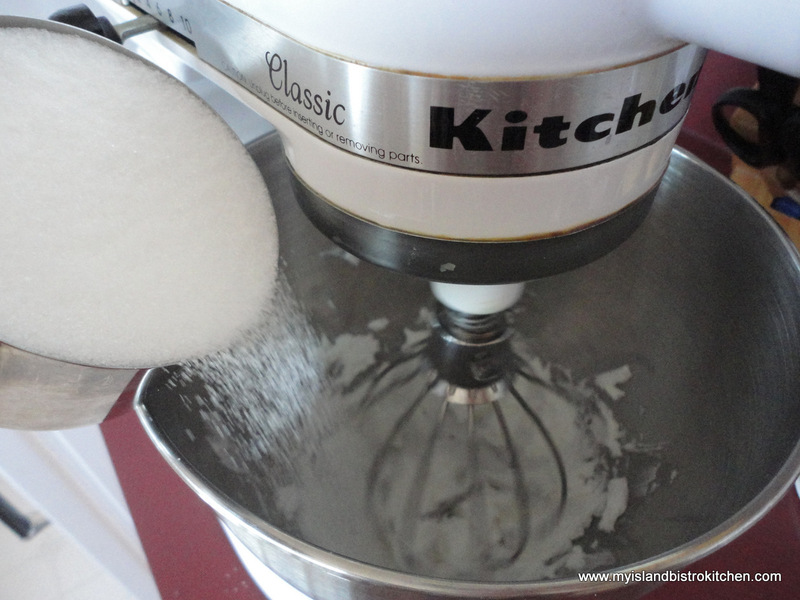 Add to shortening-sugar mixture and beat until incorporated. Add lightly beaten eggs and vanilla. Mix together well. 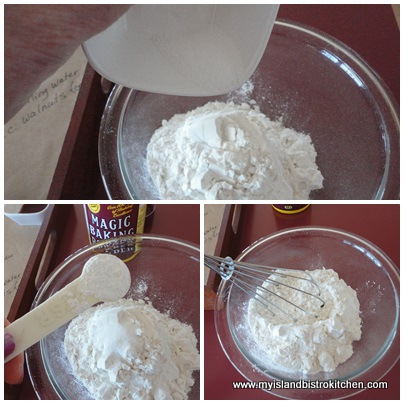 Whisk flour, salt, and baking powder together. 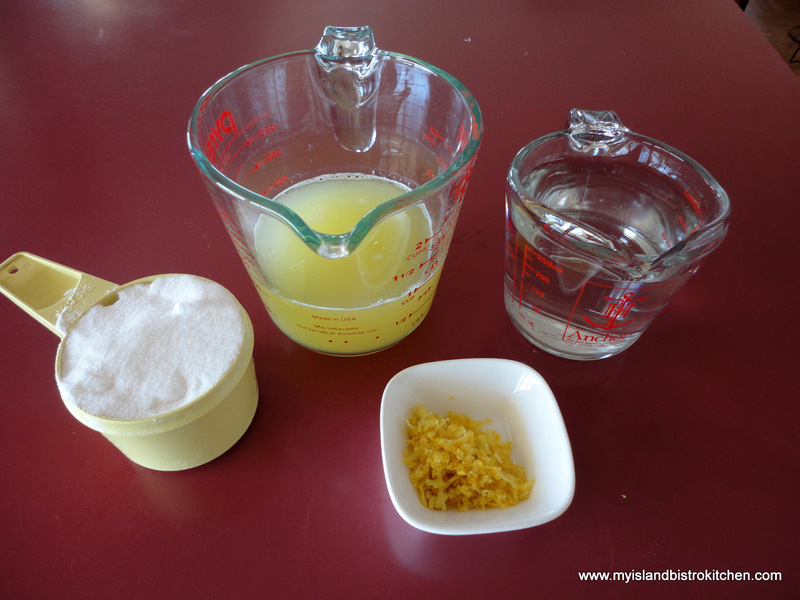 Add dry ingredients to liquid ingredients, mixing only until dry ingredients are incorporated. Stir in walnuts if using. Transfer batter to prepared baking pan. Spread evenly. 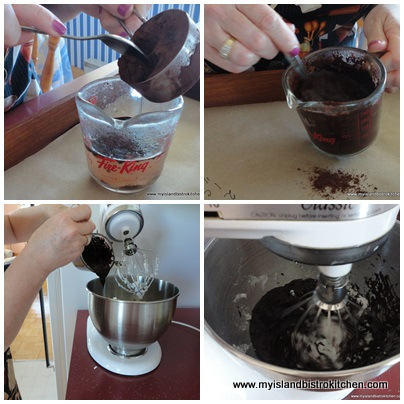 Bake for 25-30 minutes or until cake tester inserted into centre of brownie comes out clean and sides of brownie shows signs of pulling away from the pan. Let brownie rest in pan for about ten minutes then, using the edges of the tin foil as handles, gently remove the brownie from the pan and transfer to wire rack to finish cooling. When completely cool, cut into squares and ice each square with a dob of icing and decorate with a piece of maraschino cherry, if desired. 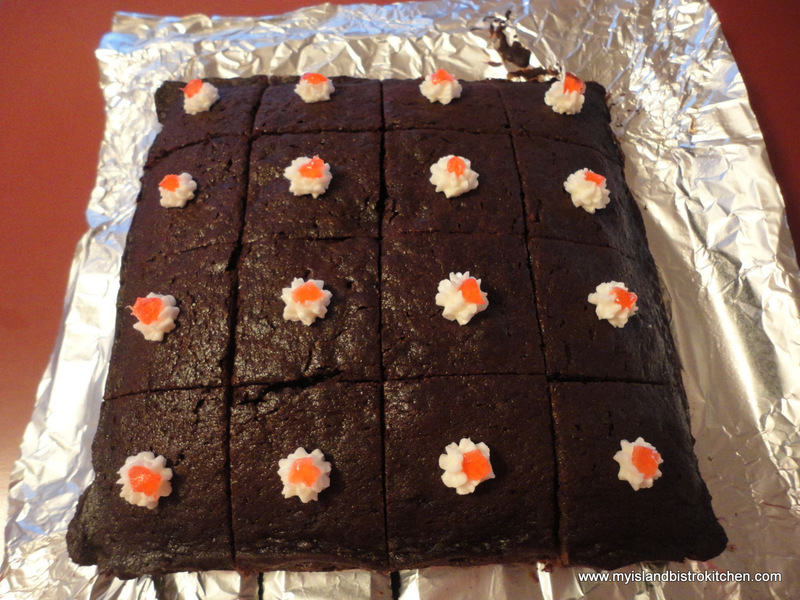 NOTE: These brownies may also be baked in a 9”x9” pan for about 25 minutes or until cake tester inserted into centre of brownie comes out clean and sides of brownie show signs of pulling away from the pan. 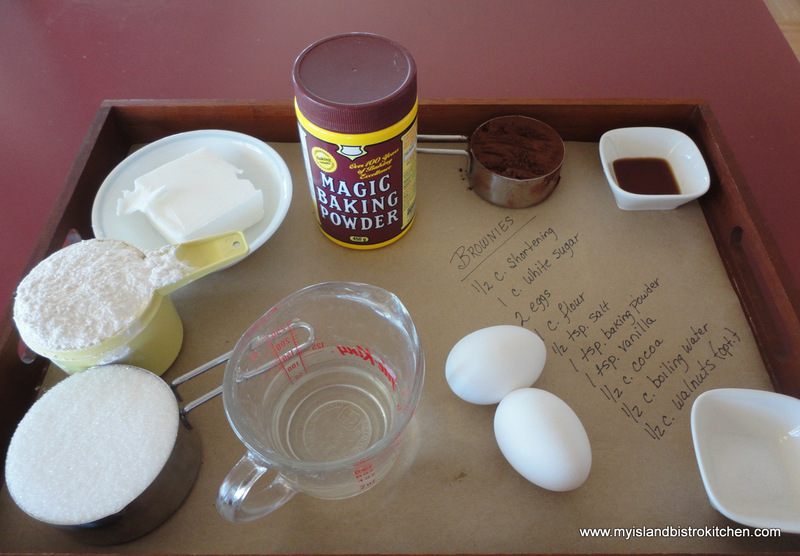 Baking them in a 9″x9″ pan will yield more dainty brownies. 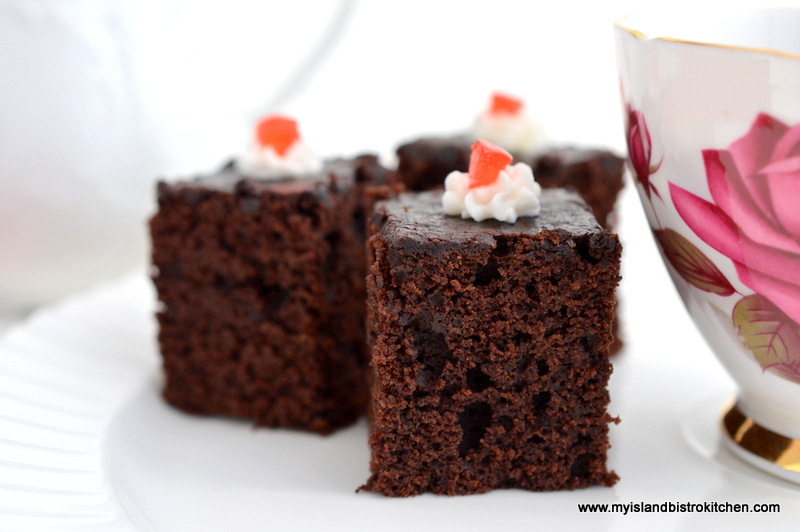 These easy-to-make cake-like Chocolate Brownies are moist and delicious and will be a hit with any chocolate lover. Whisk flour, salt, and baking powder together and add to liquid ingredients, mixing only until dry ingredients are incorporated. Stir in walnuts if using. Transfer batter to prepared baking pan. Spread evenly. 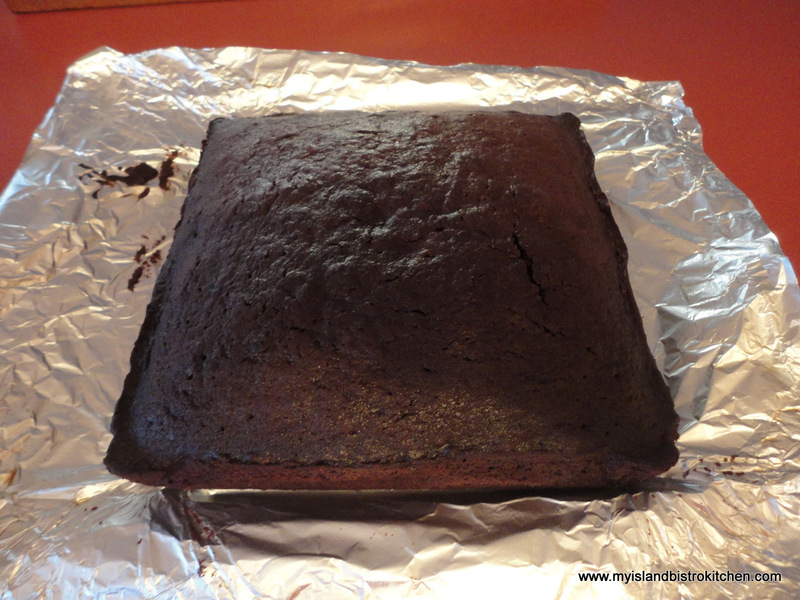 Bake for 25-30 minutes or until cake tester inserted into centre of brownie comes out clean and sides of brownie shows signs of pulling away from the pan. Let brownie rest in pan for about ten minutes then, using the edges of the tin foil as handles, gently remove the brownie from the pan and transfer to wire rack to finish cooling. 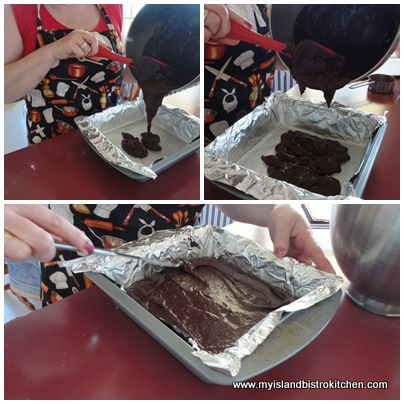 NOTE: These brownies may also be baked in a 9”x9” pan for about 25 minutes or until cake tester inserted into centre of brownie comes out clean and sides of brownie shows signs of pulling away from the pan. 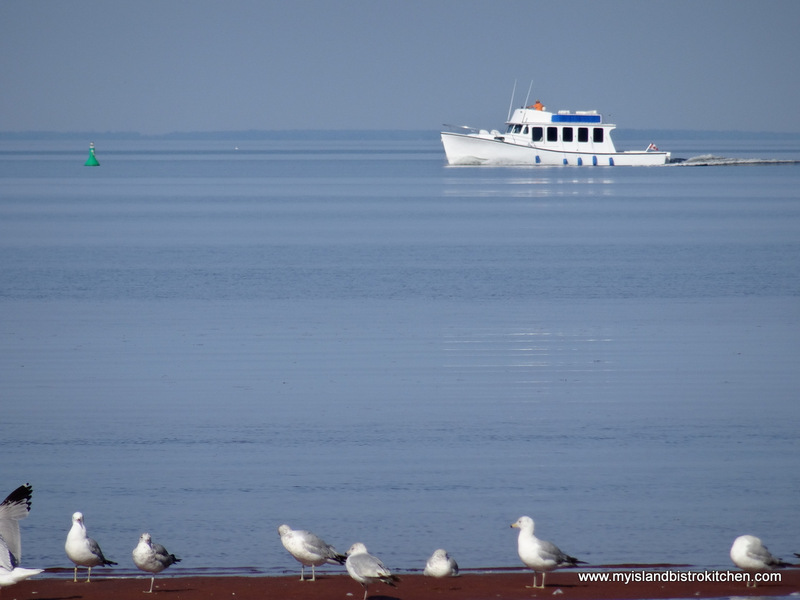 On PEI, Canada Day heralds the true beginning of the summer season. 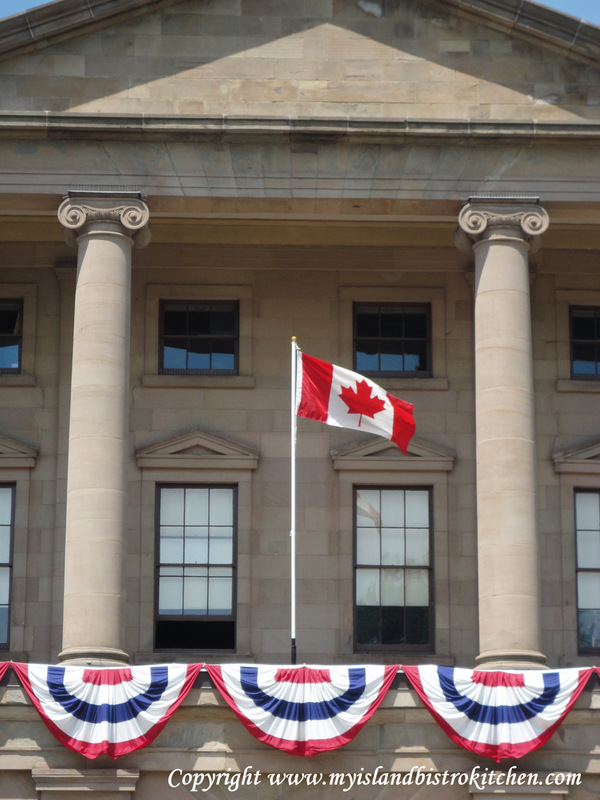 Once Canada Day celebrations are underway, Islanders are in summer mode. 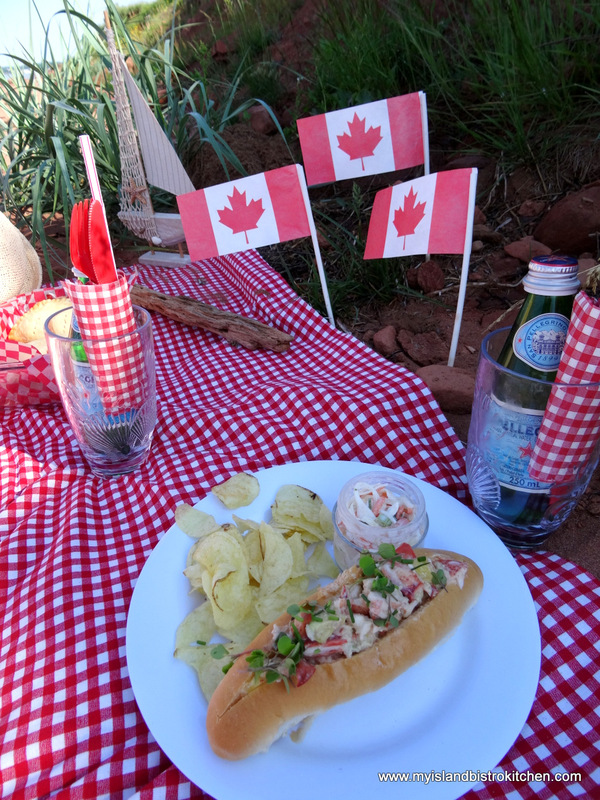 Once again, this year, we are celebrating Canada Day with a picnic. I have chosen a beach location on the Island’s south shore. 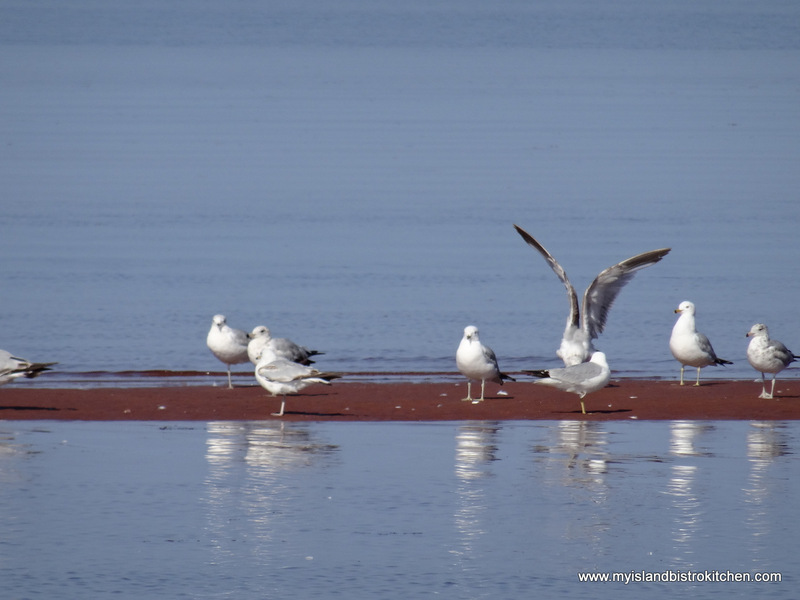 Beaches on the south side of the PEI commonly have more red sand than those on the north side which tend to have sand in a more pale pink color. 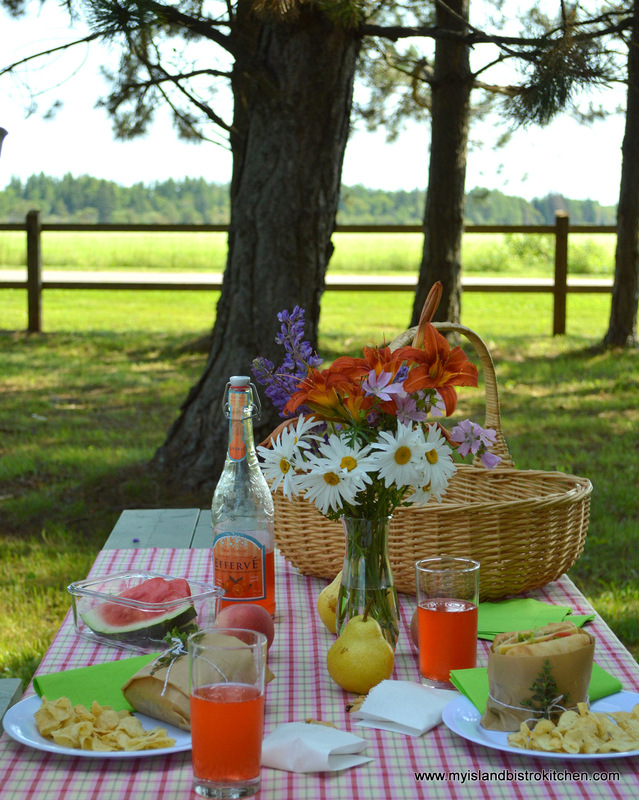 Picnics are a great way to engage in casual dining. However, that doesn’t mean a pleasing setting can’t happen. 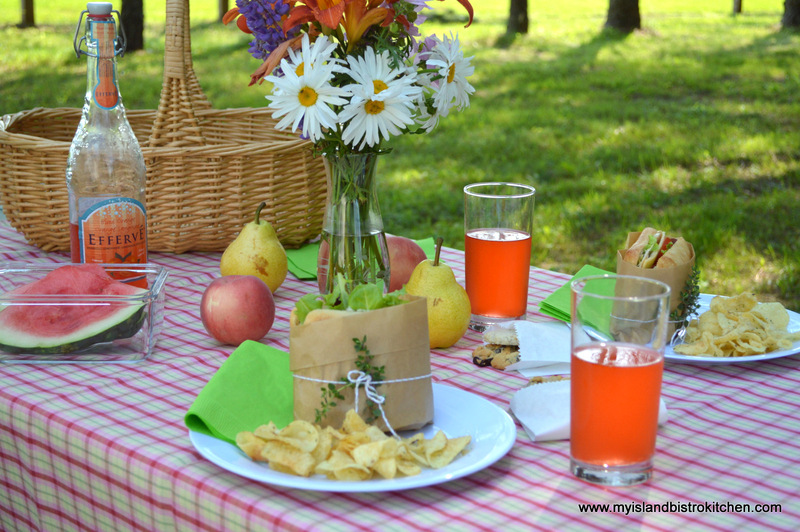 In honor of the colors of the Canadian flag, I have chosen a red and white theme for today’s picnic. Yes, my choice of foods is even red! 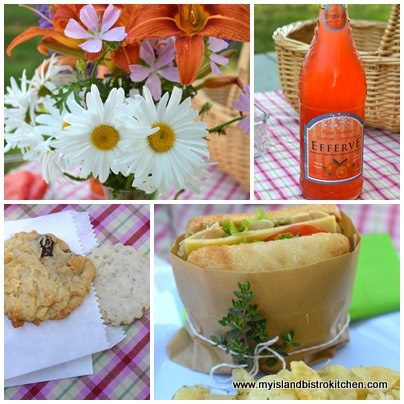 I love my antique picnic basket with its red and white gingham liner. 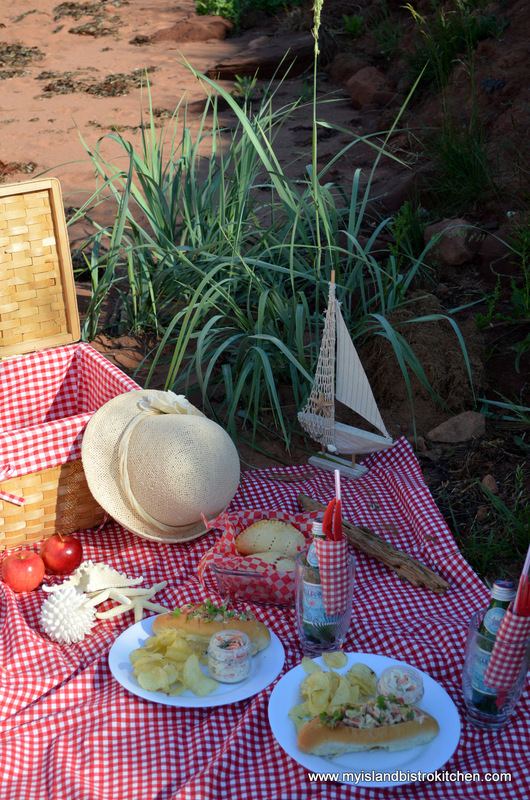 A red and white checked cloth sets the stage for the picnic lunch. 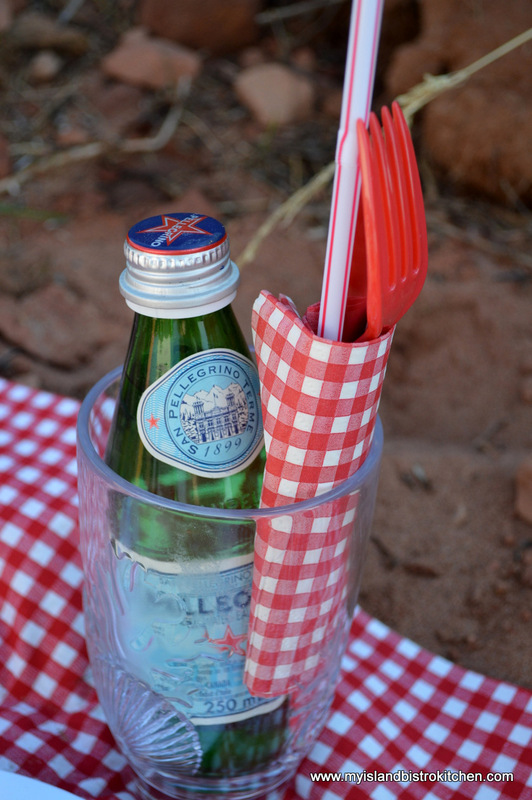 One of the things I like to do in preparation for a picnic is to wrap the utensils and drinking straws inside the napkins and place them in the glasses. 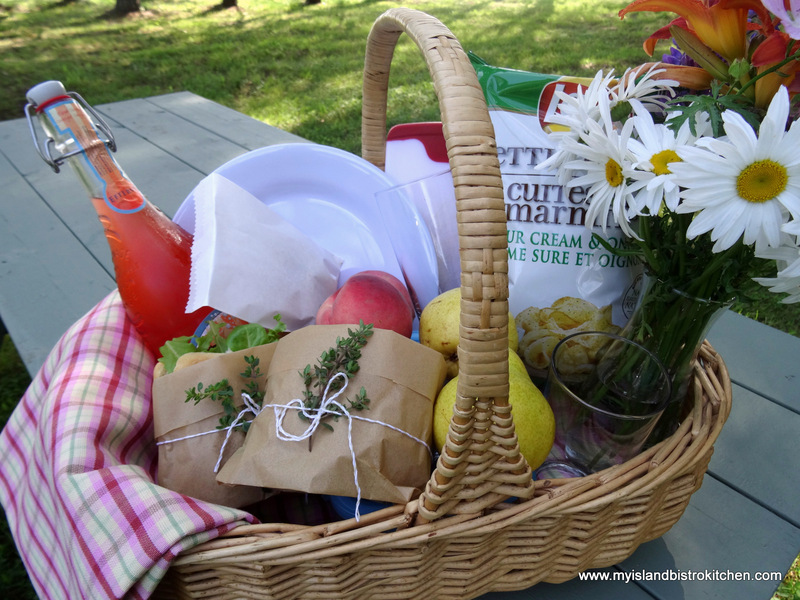 They are quick and easy to pull out of the picnic basket and I’m sure not to forget utensils and napkins when I do this prep work before leaving the house. Non-breakable dinnerware has come a long way. The white plates have the china look but are really just lightweight, unbreakable dinnerware from a dollar store. Regardless the venue, food always looks appetizing on white plates. 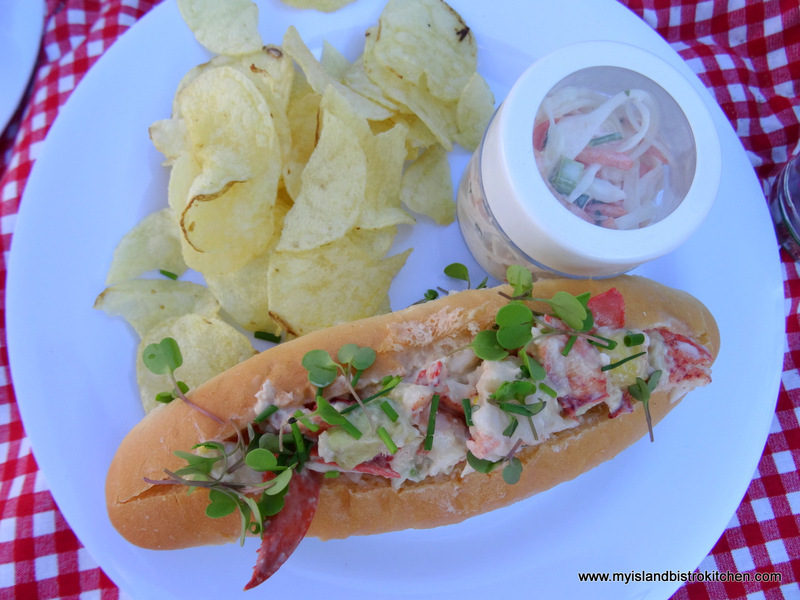 While I normally like my lobster rolls with little else but the lobster and mayonnaise and maybe some celery, I did jazz these up a bit. I added pineapple and avocado and used a citrus aioli to hold the ingredients together. The rolls came from Mary’s Bake Shoppe in Kensington, PEI. For these rolls, I wanted ones that would hold together and had a nice texture and flavour. These certainly met the challenge on that front. I sprinkled each roll with a few sprigs of microgreens we’ve been growing along with some fresh chives from our herb garden. A tasty coleslaw and some potato chips rounded out the main course. For dessert, I was looking for something that was easily portable and tasty. 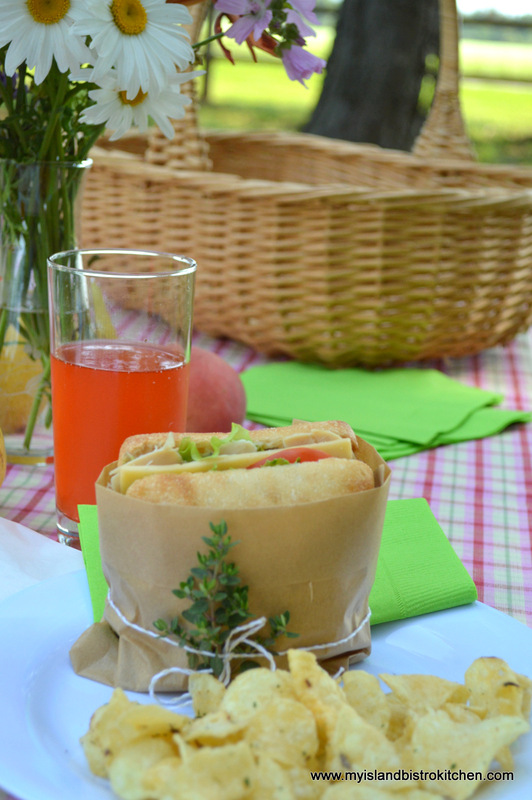 Hand pies are a common picnic food because they hold together and pack well and you don’t need plates or utensils for them. 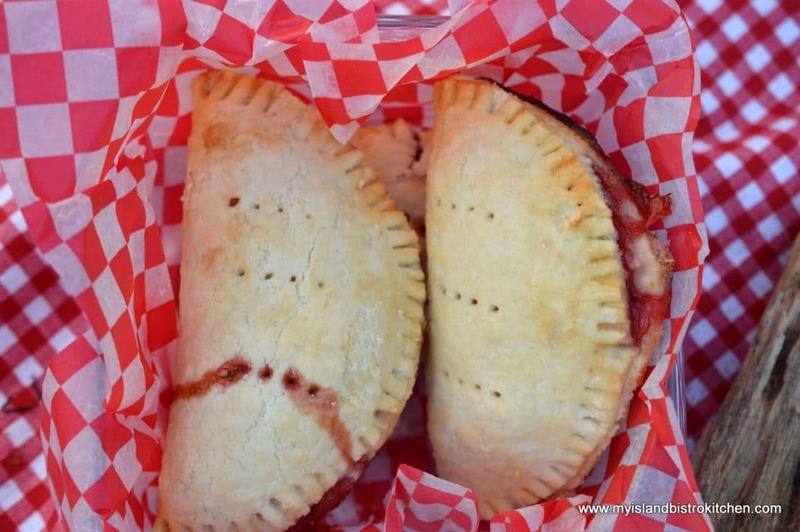 These tasty treats combine two complimentary flavors – rhubarb and strawberry – encased in a flaky pastry. 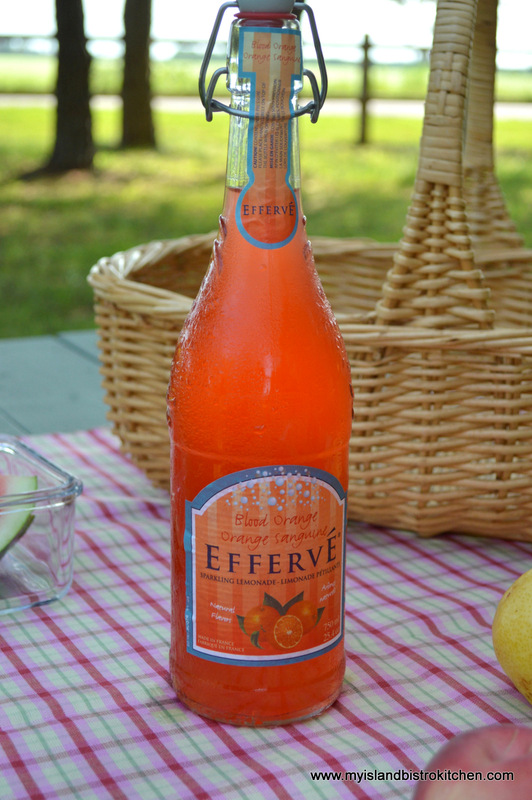 Add some fresh fruit, such as apples, and your favorite beverage, and the picnic fare is complete. And this was the view from our dining spot on the beach. 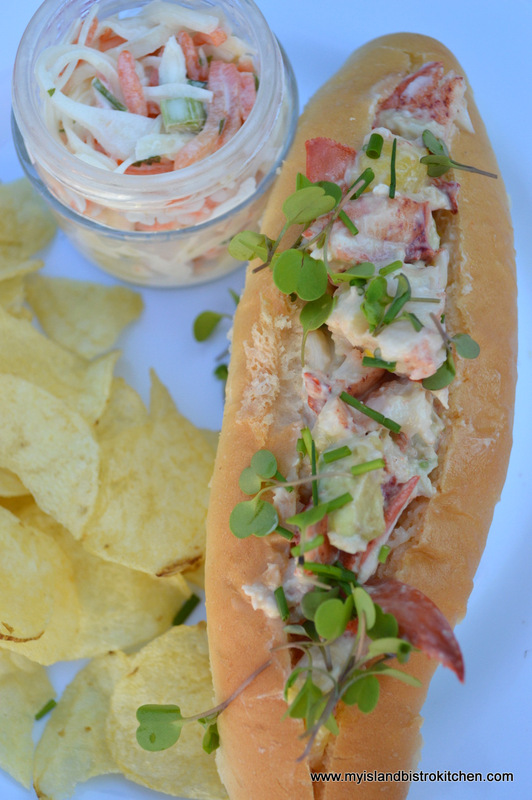 Better eat our lobster rolls before these guys decide to fly on over and join us for our picnic! 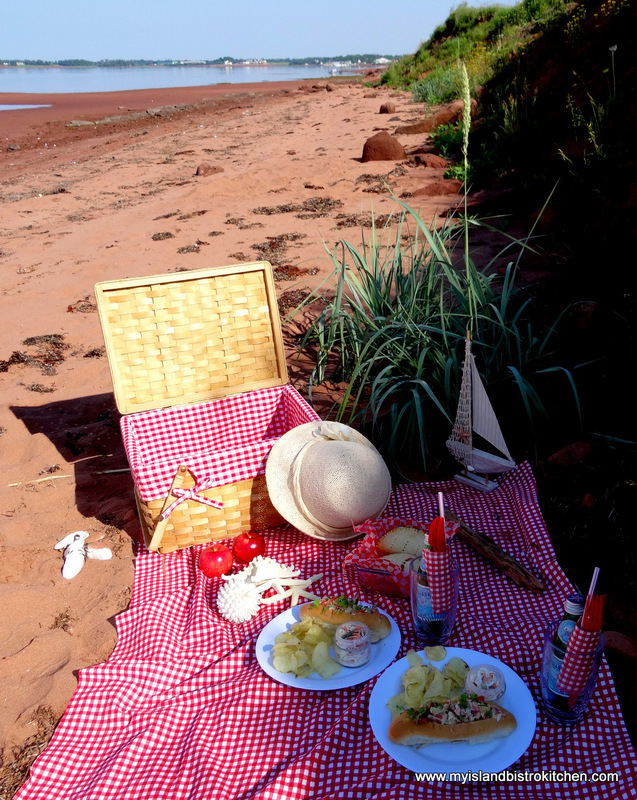 I hope you have enjoyed a glimpse into our Canada Day picnic in PEI.